El Best Western Kinloch Hotel se encuentra en el centro de Isle Of Arran. Venga y disfrute de las mejores atracciónes turísticas cerca de nuestro hotel. Precios bajos garantizados y ofertas exclusivas. In a lovely location this hotel is a very good 3* hotel - excellent food, very attentive and professional staff and liked that dogs were welcome with a designated entrance. Great hotel would definitely use again. Excellent hotel, first class staff. food great, great food choices. great range of wines, good range of spirtits. prices were acceptable. All staff were very friendly which I like in a family run hotel. Came here as a party of 4 with my wife and brother in law and his wife booking in at reception was quick and easy this time were on the same floor and just a couple of doors away down the corridor. Our room was nice clean and warm as the weather was a bit iffy the view from our window looked over to the Kyle of Lochalch but it was covered in mist but the following morning it was in glorious sunlight. We had dinner in the restaurant and the food was excellent. The lounges are really nice, bright and modern. Breakfast was again excellent with a wide choice on offer fruit, cereal and full Scottish breakfast. I recently stayed at this establishment for business. I stayed for a total of 12 days. WiFi in the hotel worked for a total of 0 of they days. I also made enquiries to play squash - I was told it was being used as a classroom. The toilet within the room was clean, as was the room however the smell from the traps on the shower and the sink was enough to nip the eyes. To kill some time (as the WiFi was not working) I decided to go for a swim, big mistake! The sea outside would have been warmer. At this stage the sauna looked tempting to warm up - it was broken! How could I forget, the temperature in the rooms would be more accustomed to a polar bear. Other than that it's clean, definitely not cheap and quite friendly. Great room with a view very spacious only thing no extractors in bathroom but clean . Meals very reasonable but not from local butchers very disappointing not supporting locals. Recommend booking meals on arrival as we had to wait over an hour. If you love beautiful views and great walks and amazing sea views there's no better place than The Kinloch Hotel at Blackwaterfoot Arran. The staff were lovely, our room was spacious and freshly decorated and looked straight onto the sea and lovely views. The staff were attentive in the restaurant and we enjoyed nice food. The only down side is if you are vegetarian there's not a lot of choice. "Excellent stay. Great refurb. " I have stayed in the Kinloch several times before and it has always been very good. However since the full refurbished the hotel was excellent. Friendly and helpful staff, superb surroundings and the most beautiful location. Perfectly situated in the best side of the island, in my opinion. Breathing views and peaceful surroundings all make for a great getaway from mainland life. 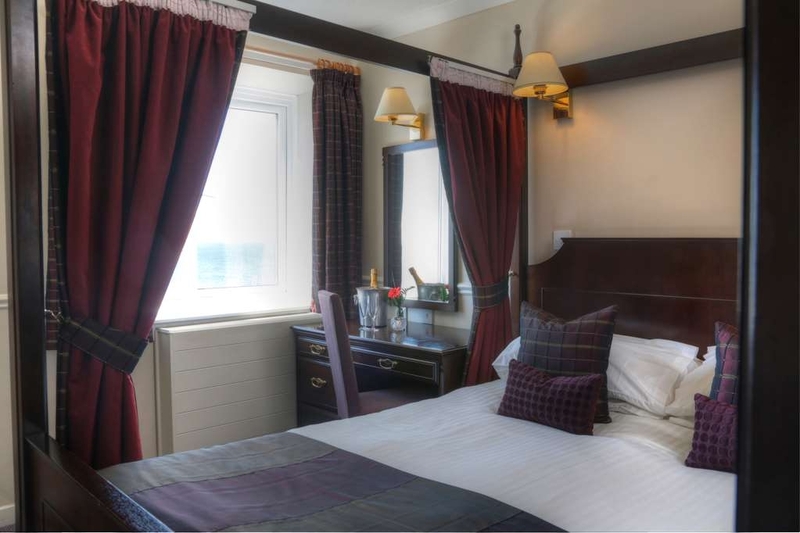 Tastefully refurbished and decorated matched with charming and helpful staff who make sure your stay lives up to expectations. These people know how to make your holiday good. Coupled with good modern food Kinloch ticks so many boxes. Amazingly comfy beds that allow great views of the beach, Kilbrannan Sound and Kintyre. Ideal for visiting the many delights of the island it's a perfect base to see Scotland in miniature. I definitely will be back ! We stayed at the hotel for one night in February on a great B&B rate. The simply-decorated and furnished bedroom was huge, with a direct view of the sea and the seals on the rocks. We slept really well in the queen-sized bed. My only niggle with the room was that the bathroom was really cold. Even on a moderate February day, the small towel rail, though quite hot, was just not powerful enough to keep the bathroom (which had an external wall) up to temperature. The good-sized guest lounge backs on to the next-door bar, and we were able to have a drink before dinner in very comfortable surroundings. We ate a nice meal in the restaurant at night, where the service was excellent. Despite the restaurant being quite quiet, with only half the tables being used, we had been very restricted in choosing a time. I can only assume that they didn't want to be run off their feet, but my view is that they could have coped with more diners without compromising on the service provided. Breakfast was very good - with a good buffet selection including cereals, juice, fruit, yogurt, etc, and the hot items cooked to order. Have stayed many times before and will do again. The rooms here are lovely and many more recently renovated than last time I stayed. The room we had this time was freshly painted and decorated. Lovely spacious room with a sea view (room 11, first floor, if you want to request it). Bed was very comfy and we had a good TV as well as tea/coffee facilities. The restaurant was great quality during our stay and we both really enjoyed two evening meals. Staff are very friendly and efficient. Place is great for kids with the pool, and the bar is very family friendly. One of my favourite places on the island. We were last here ten years ago and remember a generally run-down experience. This visit could not have been a bigger, let alone thoroughly enjoyable, surprise! Refurbished to a high degree and one of the few hotels with a genuinely comfortable lounge and a delightful outlook. Room was clean and functional, again with a lovely sea view and the restaurant - more tasteful refurbishment - pleasant with good reasonably priced food. All in all a very good deal! We booked a couple of days in this lovely hotel. Each member of staff is friendly and efficient. Service is very good and the menu is varied and appetising. The room was warm and very comfortable. We will be back. myself and my wife both had a very pleasant stay at the best western kinloch. a very nice hotel with nice rooms all very modern with high speed wi-fi , and a big comfy bed gives a good nights sleep before a nice big buffet breakfast to set you up for the day , well worth a a wee visit is this hotel. "EXCELLENT food - POOR hotel/rooms"
My wife and i stayed here last weekend after receiving an overnight stay for two voucher as a gift. The hotel is in a lovely setting - great views over the water. The hotel has also been renovated since our last visit so the reception, dining and lounge areas are all very modern looking and again lovely views from each of the sitting areas. The food in the restaurant could not be faulted at all. My wife had leg of lamb and i had venison haunch and both were out of thus world. The staff in the restaurant were also lovely. However from there it was downhill, we stayed in room 54 on the ground floor with sea views. The room itself was basic but clean, the bathroom was absolutely freezing (which we used to keep our drinks since there was no mini bar) and looked very shabby. The bed looked great as it was a super king size but the mattresses were the worst that we had ever slept on. You could feel all the springs, over the whole of the mattress, on both mattresses, protruding through the top. We looked at flipping the mattress (at midnight when we went to bed) but was the same on the other side. Needless to say we both tossed and turned the while night, had very sore backs, and feeling anything but refreshed the next day. We went to the swimming pool in the morning, managed one length in the ice cold pool, jumped in the sauna and that was just as disappointing. We had to stand for 10 mins trying to pour water to get the room hot enough, then find and area of the sauna where there wasnt a draught blowing through the wooden panels (which were hanging from the ceiling). We had already debated wether or not to stay on the second night or head back for work the following day. After the sleep we had we had no choice but to leave after the first night. We mentioned to the receptionist upon checking out about bad the bed was. And all she said was that she would pass on our comments. She said some room upstairs had mattress toppers. Eh, i think all rooms need them if the mattresses are that bad. We are regular visitors to Arran and would definitely recommend and visit the restaurant, but as for the hotel i think theres still some work to be done before the rooms and leisure facilities are of an acceptable standard. "Superb Service at the Kinloch"
Just back from 2 nights at the BW Kinloch. A hotel with a great location, evident that it has been refurbished and updated to a good standard and very comfortable. The food was delicious and for such a remote hotel the choices amazing. Best of all were the staff: so friendly, accommodating, and helpful. Always smiling and providing a consistently warm welcome for all. "Light bright and wonderful views"
A wonderful makeover to this hotel sitting yards from the sea with walks and views to die for.A light bright and airy restaurant serving both lunchtime light bites or a full meal--your choice--helpful and cheerful staff with a wonderful view.A short walk to the 12 hole golf course and walks to the Kings caves are on the doorstep,what better way to spend a day here. Stayed for 2 nights with friends. Great deal for the room and ferry. Staff all friendly and polite. Our room had a lovely view of the sea and was immaculate. We had dinner both nights and the portions were a good size. Breakfast had great choice and was help yourself. That good we have been four years in a row now. See you next year. "relaxing stay with great views"
We benefitted from special deal including return ferry crossings. All the staff are very pleasant & helpful. We had great seaview room. Bedroom was comfortable, bathroom was ok, but tired. However, bathrooms are due for refurbishment over the winter. Breakfast was great. Fresh fruit, yogurts, juices, pastries as well as large range of cooked items. Only disappointment were evening meals. Not of a great standard quality wise, though reasonably priced. Maybe we were unlucky. Enjoyed 3 relaxing nights at the Kinloch. Great staff, food, sea view and an amazingly comfy bed. We ate the lamb, venison, curry, fish and all were excellent. A great value winter break. and I could enjoy a swim too. perfect. This hotel, part of the Best Western chain is aptly named - THE best Western hotel! I have stayed in a few but this was head and shoulders above the rest. Rooms are well equipped , comfortable and cosy. Staff are fantastic - going above and beyond. If Arran was nearer and more accessible I would be back there on a regular basis. It's a few years since our last stay at the Kinloch and I'm pleased to say that it still represents fantastic value for money, clean and comfortable room with one of the most comfortable beds I've ever slept in, the food in the restaurant and the breakfast were amazing, friendly happy staff put the finishing touches to this family run hotel. Well done Kinloch. Lovely comfortable room with sea view. Great choice for breakfast and great menu choice for dinner including smaller portion choice. Staff so helpful, very welcoming and pleasant. This was our 2nd time and will definitely return. "Lovely hotel and sea front location"
First class service and lovely seat front location. Great food in restaurant and friendly, helpful staff. Would highly recommend for a peaceful holiday. Lovely island with great scenery. Would definitely recommend. "Lovely hotel with great facilities and staff"
The hotel is perfectly located with plent of views out over the bay. The restaurant has a great range of local produce with a good mix of food styles to match all tastes. Rooms are well appointed and in our case with a view over the bay which made for a fantastic sunset and sunrise. The staff are very helpful and knowledgable of the local areas and attractions. "So much better than the external appearance suggested"
The architecture on the outside is a bit soulless so I wasn't expecting great things. Wrong. I was welcomed warmly and led to a good table in the restaurant where my dinner was excellent. Great seafood and good selection of drinks. Stayed at the Kinloch Hotel for two nights, got a great deal including ferry tickets and meal allowance. Evening meal was great and breakfast was very tasty! Had a swim and sauna in the morning, great walks nearby and lovely views. We had our dog with us who was welcome in the bedrooms and public bar area. "A must for anyone who values excellence"
Kinloch House Hotel Arran. You will not be disappointed this Hotel can rival any 5 star hotel experience in terms of all aspects of customer service , rooms, food and the friendliness of staff. Beautiful location and a must for anyone who loves golf. We stayed for 3 nights and absolutely loved the Kinloch Lodge. Robbie and his young team were fantastic - very friendly and welcoming. Nothing was too much trouble for them and we greatly appreciated their cheery way of dealing with everything. Very comfortable room with a fab sea view. The food was excellent - freshly prepared breakfast buffet and a lovely dinner each night with a great choice of starters, mains and puds on the D, B & B menu. Quality food, well-prepared and presented. We were a party of 10 ladies playing the Arran Challenge and will definitely be back. Shiskine is a terrific golf course - "challenge" is the correct word for it! The course is 5-10 mins walk from the hotel. We were unlucky enough to be soaked one day but no worries as the hotel has a great drying room which would put many larger golf resorts to shame. We also played Lamlash and Corrie and now have suitably strengthened leg muscles. It's no wonder people return to Arran every year - it's a magical place. Just back from a lovely stay at this wonderful hotel. The staff couldn't have been more helpful & kind. The food was lovely & we were lucky enough to get a room with a sea view. We were golfing in the Arran Challenge at the stunning Shiskine course & the hotel arranged everything for us. They put together an unbelievable package with ferry transfers & golf included. Just brilliant. Couldn't recommend this hotel highly enough. Well worth a visit & if you are a golfer, an absolute must! We stayed here for a long weekend, lovely hotel right next to a sandy beach, looks recently refurbished, good fresh decor and furnishings, and I sank into the most comfortable bed I've slept in in a long time and slept like a top. We had a lovely seaview. Delicious food, well presented and served by friendly attentive staff. All in all a good stay. "A Wee Gin Stop Off!" On a tour Round Arran when visiting my friend we stopped off at the hotel. We were too late for food (no food between 3-5pm I think) but we decided to have a refreshment. As a gin fan I was very impressed by the range of gin that was on offer. The staff were very friendly & helpful. We sat in the comfortable seats beside the large window - if felt like we were in our lounge. The views were stunning over the water & there were lots of seats outside which would be great on sunny day. The Germans at the next table were enjoying homemade scones! The dining room was set up for dinner & looked lovely. I will definitely return for food on my next visit! Our holiday cottage is only a short drive from this hotel so we popped in for dinner. 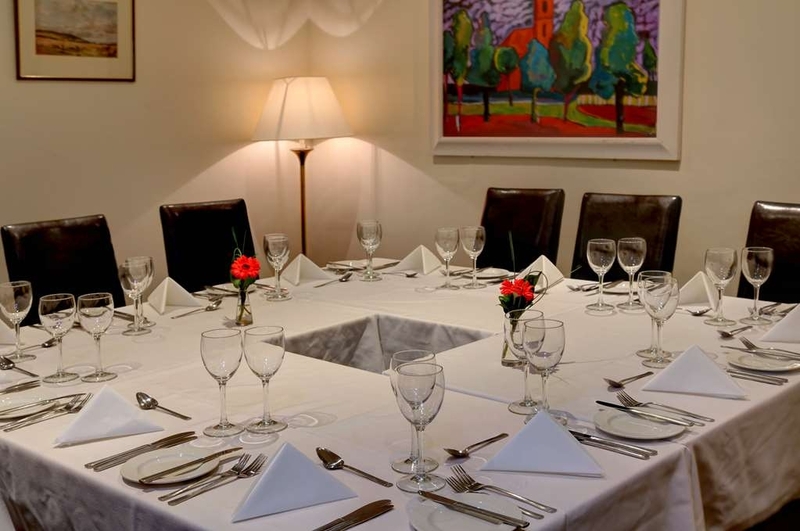 The restaurant is very nicely decorated, bright, airy and spacious with a young friendly staff giving great service. The menu was varied food we ordered was excellent . We booked to go again on Friday. "A wonderful meal in excellent surroundings"
Visited Arran over the summer and not sure where to eat. Came across the Kinloch Hotel and stopped for lunch. The food was very fresh and plentiful with lovely views over the sea. Staff were helpful and friendly. Would definitely recommend if you visit. Had 4 nights in this hotel superb . Food stunning Staff outstanding Rooms superb Great WiFi Views were stunning Plenty parking Beautiful walks Bar prices were good Swimming pool Couple of shops nearby and a superb bakers. Can't wait to go back One of if not the best hotel I've stayed in thus year. Great location. Great views if you have a room overlooking the sea. Very clean and well laid out room. Very comfy super king sized bed. Good breakfast selection. Restaurant has a good selection of food using local ingredients. Nice size swimming pool. Offer a range of great deals. We enjoyed a lovely wee break on Arran staying in the Kinloch Hotel. Our room (21) had a great view overlooking the Mull of Kintyre. Staff at the hotel were very friendly and efficient. Food is of a really good standard and menus were varied.I especially enjoyed the buffet style breakfast and highly recommend the black pudding. We would definitely stay here again. "Good base to explore west of island"
Stayed two nights eating in restaurant both evenings. Food good with a comprehensive selection. Hotel pretty good with helpful staff. Creakiest and slowest lift I've been in for ages. Sea view from room so you could see the Mull of Kintyre and N Ireland if it was clear enough. Just arrived in the Island so popped in for dinner. Lots of signs saying booking was essential but we asked for a table anyway as it was early evening. Luckily they had a table and we were told there may be a wait due to a large bookings order. Service was very good and friendly. Food came really quickly despite the earlier warning. They do smaller portions which we had but they are still really big. We had 2 young kids with us and staff were really nice with them. Will be again as food was delicious. Seven of us visited this very well renovated hotel for dinner. Full marks to the young members of staff who were friendly,welcoming and efficient. The food was excellent. We all said how beautifully cooked everything was, portions were generous and well presented. The ragout I had was perfect, the veg was crisp, nothing negative was said by any of us. Highly recommend it as a very pleasant and comfortable restaurant. There evenings you just go for a drive on the island and fancy a drink. This hotel has an excellent well stocked lounge bar to do so. From there you can enjoy the views over the water and Kintyre. Well we might wanna stay here someday when we get back to Arran. The renovations has really improved the place. They've replaced all the dreary and dull furnishings with bright modern colours. The lounge area and restaurant is charming and the rooms are clean and roomy. The breakfast is great as usual with a good selection and service is friendly. Only complaint we had was with the beds. You can feel the springs when sleeping - slightly uncomfortable. Other than that, we had a good stay and will definitely return! Stayed in room 15. Best Best Western i have stayed in, and i stay in hotels about 150 nights a year, location absolutely brilliant with fantastic views, staff the best and food lovely and reasonably priced. If staying on the isle of Arron would definitely recommend!! Quite a nice hotel in a very nice location. Blackwaterfoot is a bit isolated from the rest of the island, but that may be a big plus for some guests. But this is the only place to eat or drink without having to drive. Very friendly and attentive staff, pretty good restaurant, noisy bar. Only letdown was a few basic minor maintenance items in the room that would take minutes to fix but detract from an otherwise high quality accommodation. 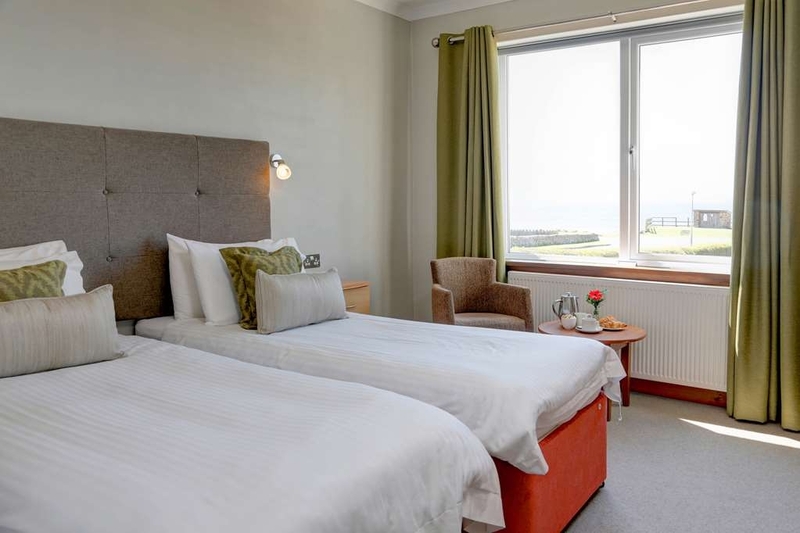 "Great improvements to this hotel"
Room 15 small and adequately equipped, large window with exceptional sea views, very comfortable beds, fresh and clean, extensive tv listings. The restaurant ( we dined morning noon and night) was superb with excellent range to suit all tastes. The breakfast was buffet style and the choice was extensive. The staff were really pleasant and the food service was prompt. Prices were very fair and they have a deal which includes return ferry fare and first night dinner included. We paid £75 per person per night and there is a £20 per person allowance for the inclusive dinner on the first night. The only criticism was that the TV was very small and did not swivel sufficiently to allow both beds proper viewing. There is also a swimming pool and sauna, ample lounge areas and bar areas, and there are self catering apartments on the third floor. There is also a convenient lift. I would not hesitate to thoroughly recommend this hotel as all in it is very good value for money. Great meal at the Kinloch hotel and even better service. Left my Visa card at another local business and didn't realize it until the business was closed for the day. The receptionist at the Kinloch made a few phone calls and tracked the employee down at her home to confirm that my card was safely locked up for the evening and I could pick.it up the next morning. Thanks for going above and beyond!! "Want to move there !!!" Family visit again. Ferry deal. As always great value. Fantastic food. Fantastic staff. Further recent improvements to furnishings are brilliant. The location is out of this world. Can I move in permanently please???!!! The Kinloch Hotel in Blackwaterfoot on Arran exceeded my expectations, especially as I'd been able to book through a booking agency for such a low price that a friend who'd stayed there before wondered if they would be putting me up in the "byre." Quite the contrary! I was afforded a lovely room with a king sized bed with a gorgeous view of the sea! The room and hotel in general were clean and well-kept, and the staff were helpful and friendly. The food in the restaurant was excellent as well. I stayed here on a coach trip recently. My friend and I had an excellent newly refurbished room with a sea view which was glorious. It was very clean and we had everything we needed to hand. My only small criticism would be that the wash basin was too small even for washing hands and cleaning teeth. The staff were friendly and helpful. The breakfasts were most enjoyable and set us up for the day. The evening meals were very good too although the vegetarian options were a little short on protein and very large. They had a good selection of drinks in the bar in fact everything we needed was amply provided for. "Amazing hotel with very friendly staff and beautiful sea views (including seals) "
We stayed 4 nights in the hotel. Before we arrived we were worried by the lack of nearby restaurants but after eating at the hotel for the first night we realised that the food there was lovely and there was plenty of choice to last us our stay. The downstairs of the hotel was fairly recently renovated and had some lovely lounge areas for drinks. Breakfast was served in the restaurant with lovely sea views and the choice was excellent - proper Scottish cooked breakfast (including rolls!) and a lovely fruit salad were the highlights. The pool was well maintained. The hotel looks over the beach as we loved watching the seals on the rocks at low tide! The standout feature of the hotel though was the staff - incredibly friendly and genuinely seemed interested in the guests. I spent three days on a coach (bus in America) tour that used this hotel which I really enjoyed. The hotel operated efficiently, we had our meals in the dining room that the hotel organized for the tour; views were lovely, there was lively bar filled with guests and people from the area, and an indoor pool. I enjoyed talking to the guests in the hotel who from Scotland and trying to figure out what they were saying: It was like watching the series Shetland without Netflix. The proprietor was working all over the the hotel every day. This hotel was a joy, except for one thing, there is a free washer and dryer for the guests (I was on tour for two weeks), but I thought my life was not going to be long enough for my clothes to get complete try. No worry, I used the radiator in the room. This place and the village it is located in is a gem. Had a 3 night stay at this hotel. It was memorable for the room, excellent food, friendly staff and the view from the bedroom window was the best ever, as a previous poster said the internet was down after a few hours and I personally think that the staff should have informed all residents of that and not us having to go to them !!! We watched the seals and even saw a Heron on the shore. Would love to come back another time ! Staying on Arran and touring the Isle came across the Kildonan Hotel. What a lovely setting for the hotel. My wife and I only had lunch but the standard of food was very high and tested wonderful. We were blessed during our stay on Arran with lovely sunny weather and having the view of the lighthouse on Pladda island eating our lunch. The staff very polite and helpful and the area's we saw were clean and tidy. Would definitely recommen the Kildonan for a meal as can't comment on being a hotel guest. "No Hi Fi to Wi Fi"
The Hotel regarding Room/Meals/Staff/Views were as on my stay last year were Top Notch but sadly the Wi Fi dropped out after a few hours of a 3 night stop and this was put down as external problems which persisted for the 3 nights. We stayed for one night and had dinner. Our room over looked the sea and as soon as we arrived we spotted a group of 11 seals sunbathing near the shore, so we dropped our bags and went out on a shore walk. We returned to a very comfortable room with everything we could have asked for. We booked a table for 7 and were seated at the window overlooking the sea. We ordered from A la carte menu and the food was very nice, perfect portion sizes and with some gluten free options available (I am coeliac). Price was a little but more than we expected, but not too expensive. Our room was a decent size and had a large double bed comprising of two singles bolted together, but this is very commonplace now and it was very comfortable and clean. Our room had a seoerate hallway which the bathroom and bedroom had desperate doors from, which I preferred. There was plenty of storage for luggage and clothes and the bathroom was big, modern and spotless. Breakfast had a good choice from full English to continental, buffet style. I asked our maitre d about what foods were gluten free, and although he was very keen to help, he didn't really know this. Fortunately, another member of staff pointed out that "allergens" were printed on the rear of the food labels at each item. We used the swimming pool there and it was very clean too. Staff at reception provide towels and locker keys. There is only one shower in each changing area, so showering before and after swimming can mean a wait if it's a busy time. There are two showers at pool area, but one didn't work and the other was so powerful it wasn't pleasant to use. We took our time packing to leave as we had been upgraded to a late check out. Unfortunately, this hadnt been communicated to whoever phoned our room and told my husband we were late on checking out at 1030. Cue some frantic packing and unecesary embarrassment at check out. The receptionist did apologise, and to be fair she was extremely friendly and professional during our stay. I've given the hotel 5 stars despite this, because the overall experience there was of luxury, comfort and welcome. I have just spent a glorious long weekend in the Kinloch Hotel and it surpassed my expectations and those of the other 34 walkers who made up our party. I don't know who was responsible was the new design and decor but they are superb. So many of our group commented on the lovely colour schemes in the hotel especially in the lounge. The blue walls on three sides offset by a burgundy coloured one sounds odd but it works really well. Chuck in 4 large, comfy oatmeal coloured settees, several smaller tables with armchairs dotted around and you have a lovely place to sit for pre dinner or apres dinner drinks with your friends. It all feels very seasidey, if there is such a word, and if you look out of the many large picture windows you can see why. Miles of sea, rocks and sand plus a few seals basking in the sun. What more could you ask for? As for the rooms themselves there was nothing but praise, but not everyone can have a sea view, and I can personal say my shared room was wonderful with three sea facing windows. The bath towels were huge, thick and fluffy which was such a lovely change from your usual hotel towels some of which are minute. The food was good and plentiful, too much at times and from the first minute we set foot in the building the staff were very attentive, polite and completely on the ball when it came to serving our group. By staff I mean everyone from the very efficient Catriona on reception, plus all the other lovely girls we had dealings with on reception, the dining room staff and the very nice lady I met who was about to tidy my room. I hope that now that the whole place has been refurbished that it is kept up to the standard it is now as it would be a shame to let things slip. My only problem now is getting rebooked By the way they do really good off season deals. "Top class cuisine in first class surroundings! " First visit to the hotel after the recently refurbished public areas and restaurant, wow what a huge investment and stunning improvement.... as always the staff were very welcoming and warm, explained the various specials and additions to the menu before taking a much needed drinks order! New menu suits everyone's tastes from your old school classics to some trendy new dishes such a beetroot gnocchi (my starter!).... prices are very reasonable indeed. I chose the gnocchi then the special of sea bass - Mum had the good old fashioned scampi - we shared some yummy dessert which was calorie free of course! Both the gnocchi and sea bass were perfectly cooked. I eat out a lot and both these choices can often be over cooked and dry. Blown away with the change of surrounding but great to see the Kinloch family values, superb service and friendly professional staff are still their priority! Whilst staying in Shiskine on holiday with family. We ate twice in the Kinloch for evening meals. The menu was varied with a good choice the desserts were to die for. Also the staff made sure my grandson who is dairy intolerance had plenty of choice to suit. Would certainly recommend this restaurant. 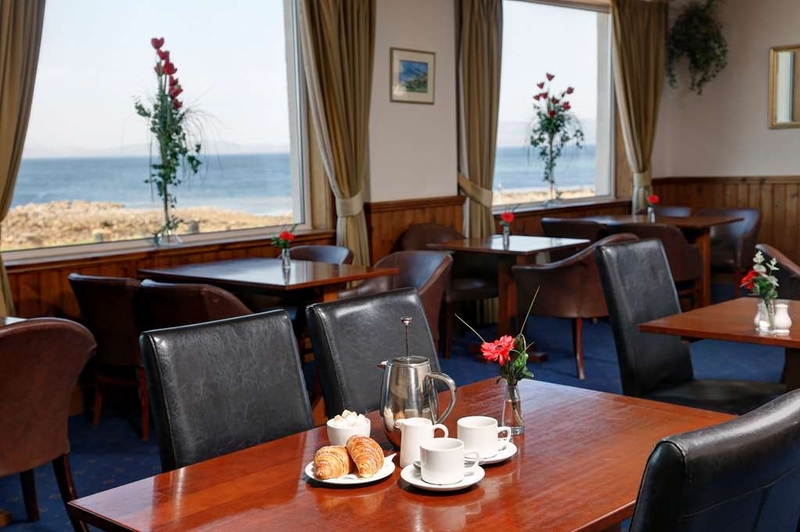 The restaurant has been recently refurbished and is tastefully decorated with beautiful views over Blackwaterfoot Bay. The fish and chips are excellent (not at all greasy) and a large portion. Staff are warm and friendly. Even thought there was a large group towards the back of the restaurant the noise didn't travel to the area where we were sat. Desserts were good too - Eton Mess and cheesecake. Discount if dining between 5pm and 6pm. Would definitely recommend and will return when next on Arran. We come every year to play golf and have always found the hotel to be excellent. Over the last couple of years the hotel has been renovated and now looks fantastic. The accommodation is very clean and comfortable with plenty of variety of room types. The facilities are good and the pool provides a welcome break from our Golf. The food has always been of a high standard and this year was no different. The staff are brilliant and nothing is ever too much bother. Our Golf and transfers are arranged by the hotel and we have never had any problems. Can't praise the Kinloch enough. We stopped here spontaneously for lunch. The staff welcomed us warmly and we sat for lunch with a lovely sea view. The sea food platter was a delight and good value as well. We will be exploring the idea of staying here in future as the location, rooms and facilities look great. I went with my fiance for dinner and it was really lovely. 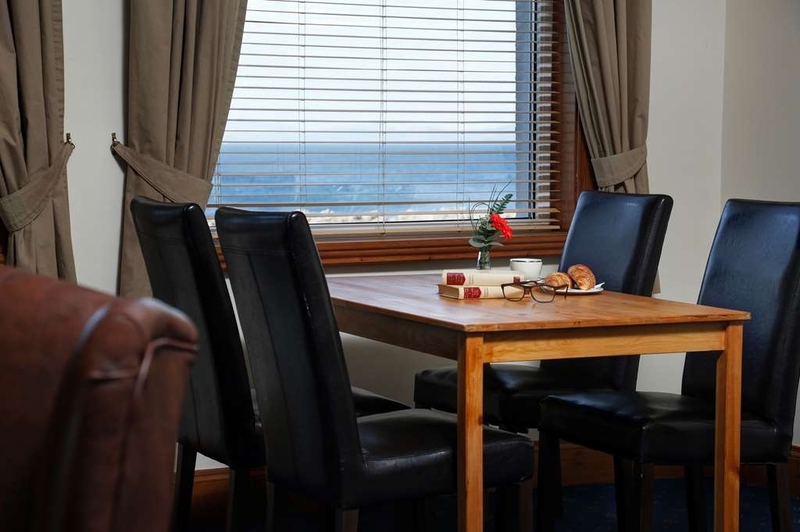 we didn't have a booking and I did worry when I saw the sign that booking is essential for dinner but we got a nice table for two by the window with a gorgeous veiw over Blackwaterfoot bay. service was great and food came fast throughout and was all piping hot. we shared a starter of haggis tatties and neeps with whiskey sauce and it was great. my fiance was keen to have the lasagne as he grew up on Arran and had fond memories of the kinloch hotel lasagne - and according to him it lived up to his memories of it. I had the sea food linguine which is always the catch of the day according to the menu - this time it had salmon and muscles. it was great and lovely but the portion was so big I couldn't finish it all sadly. the server brought me a spoon for the pasta without me even having to ask. such great attention to detail. much more than the 3 stars the hotel has would suggest - definately should have 4. to finish we had the sticky toffee pudding the share and also it was delicous. it's value for money and great attention to detail. all in all a lovely evening. We recently dined at the hotel with three young children. The staff couldn't have been more helpful. Food was delicious. Perhaps pizza was a little too large for a three year old. However, staff were quick to provide a box which allowed it to be taken home. The restaurant has undergone a re-vamp. The surroundings are delightful. All in all, this was a thoroughly enjoyable experience. I think the hotel must have been recently refurbished as it looks lovely and has stunning views. We went twice - once for afternoon drinks and cakes which we really enjoyed and back again another day for a large family meal. We booked a table for 8 on Easter Saturday and the service, food and staff were all excellent. We really enjoyed it. Thank you we will return! What a nice place on Arran! Lovely room, very comfy bed, all the necessary facilities on site. Great staff, a decent breakfast, nice bar and restaurant, easy to get to the hotel and plenty of parking on site. Lovely area for a quiet break with wide open views and some nice walks to refresh the mind. Occasional deals online for the rates so worth checking for the best prices. Highly recommend! Stayed here for two nights with two other sets of friends of ours. The room was good with fantastic views across to the Kintyre Peninsula and the décor was generally good with only a couple of small areas a little (very little) tired. What made the visit excellent was the standard of the staff. From the owner down through all the staff they could not be more friendly and helpful. The food in the restaurant also was of a really good standard and the food and wine were reasonably priced. Thank you to all the staff who were brilliant. I visited this hotel 4 years ago and wrote a glowing report with 5 star ratings across the board. If you could give more stars I would as not only have they kept up standards; they have improved on them by their refurbishment. The decor is restful and tasteful with all the comforts they had before. We had two excellent dinners, so can safely say that the food is also 5 star. I hope it won't be so long before I return here. We took advantage of a deal that was bought as a Christmas present and I have to say that, given the price paid, I was a little dubious but how wrong was I!? From the second we walked through the front doors I knew we were in for a good stay - the hotel has just undergone a revamp and the whole of the public area is lovely. All of the staff, from reception to housekeeping to restaurant staff, were lovely too. There's a good choice for breakfast, from cereals to a full cooked breakfast, and the dinners were excellent, especially the ocean pie which was superb. The bedroom was lovely too, with a fantastic view of the Kintyre peninsula. All told, I couldn't fault the hotel and we will definitely be back. Testament to a good hotel is when things go wrong and how they deal with it. We had to cancel at the last minute due to extreme bad weather. They reimbursed us the full amount and were utterly charming. We will make a huge effort to visit this hotel and stay in Best Westerns whenever we can. It's the little things that make the difference. Recently enjoyed a mid term trip away with the extended family to the Kinloch. Weather pretty average but welcome as always very warm! The ground floor re-furb looks brilliant. We stayed in a self-catering apartment on the second floor and it has recently also been refurbished. The place is looking great! We were informed before we arrived about the pool being closed but took advantage of the hotels offer to use the facilities in Brodick. Food excellent as always and staff very attentive. Will be back again! "Short break in Arran "
We arranged everything, including the ferry, at short notice the hotel. We spent four nights and thoroughly enjoyed it. Great to be able to take our dog with us. I can recommend the malt of the month! Picture was taken from our bedroom window. Just returned after three nights at the Kinloch with my wife, grandson and two daughters. Food and staff were up to their usual high standard and we all enjoyed our short break. However, it was slightly tainted after the swimming pool was closed by some jobsworth from North Ayrshire Council who decided that the hotel needs a full time lifeguard due to the pool having a depth of 1.95m. This is after the hotel operating for 40 years without a guard. The pool is used by locals as well as hotel guests. We went away for a two night stay at the Kinloch Hotel, staff were wonderful and the room was splendid, can't recommend it highly enough. The hotel the views and the atmosphere were all fantastic. We will return. There are good and bad issues here. The good : The staff are top drawer, attentive and go out of their way to help out and make sure you have the required level of assistance/service. Internet seems to be good, with plenty of accessible repeaters around the complex. Nice piece of grass for exercising your four legged friend, accessible via card operate door. Additional car park also available here which is handy when your room is at this end. Breakfast is very good, and it's buffet style. The bad : The checkout time of 10am is way too early for an island getaway, and is not comparitive with other establishments on the island. The annex is where you will end up if you are taking your dog. As a result you will have a room that is fine, warm etc, but with a bathroom that is distinctly average. Mixer tap shower over cast iron bath with the seemingly impossible task of keeping water where it's supposed to be. Not only that, adjusting the temperature without burning/freezing yourself is somewhat of an art form. Toilet cistern ran all night. Walls are paper thin, so you'll hear your neighbours. If you want/need to keep your dog with you, the bar is the only place you can eat. Dining between 5pm - 6pm attracts a 20% discount, but this makes the prices what you think you should be paying anyway. In other words, they are a little inflated even taking into account the island location. Visited with my mother in early November. I booked about a month out and got a fantastic deal. Rooms are spacious, well kept and with a great view. Staff were friendly and helpful. All round great experience. Just stayed for two nights at this lovely hotel.Set in the most picturesque spot at Blackwaterfoot.Friendly and attentive staff.Clean and comfortable rooms and a view to die for.The breakfast was of fantastic quality and variety, which was included in our deal. We also ate in the restaurant on the two evenings and again good choice and fantastic service.Great choice of gins in the bar, which was a bonus.Would I recommend this hotel...most definitely. Stayed here for two nights with a Groupon offer. When we arrived we got such a warm welcome. Every member of staff were encountered were very friendly and helpful. One member of staff even gave us a lift to Brodick. We had a lovely big room with a sea view, tea /coffee was available and topped up daily. The bed was comfortable with big fluffy pillows. The bathroom was large with a nice bath as well as a shower. The towels were immucalate and soft and were changed daily. Breakfast was lovely with plenty of choice and there was no issues if you wanted extra toast. They were very careful with my glutton free toast. We had dinner on both nights and the food was. Delicious and reasonable priced. I would definitely return. We took advantage of a special winter deal which included our ferry costs with car and headed off for two nights last week, with another couple. It was great value. Staff at the Kinloch Hotel were wonderful, the food was great and our room was spotless, spacious and very comfortable with stunning sea views. Arran is a magical island and even in November it loses none of its sparkle! Book into the Kinloch Hotel at Blackwaterfoot and make the most of some great deals. We have been holidaying on Arran for nearly 40 years. We had eaten in the Kinloch with excellent results but had never stayed there. We have seen the hotel develop over the years into what it is now. The Kinloch Hotel offers deals over the winter which seem excellent value and we were lucky enough to take advantage of one. I am always suspicious of deals so was waiting for the sting from the moment we booked. But no unpleasant surprises and plenty of pleasant ones. Yes we could have the dates we wanted. Yes, we did get a room with a sea view. There was indeed a bottle of Prosecco on arrival. What could we have on our coffee and cookie voucher? Anything we wanted. The Crawfords run this hotel and they must be among the most professional hoteliers you will come across. Robbie Crawford seems to know everyone staying there personally and if he doesn't know you, he makes you feel like he does with his very welcoming way. The Crawfords are very hands on and it shows The staff are unfailingly pleasant and efficient. They were super with our 5 year old granddaughter, particularly at breakfast. The swimming pool has been upgraded and now does the hotel justice. We had a great time and if I could have given the Kinloch 6 stars for a combination of quality and value I would have. "Really enjoyed staying at this hotel"
Perfect setting by the sea. Ample parking space and very welcoming, courteous staff. The single room was well appointed with a very good hot power shower and the radiators turned off plus the window opened so you could get some air and hear the sea (this is so pleasant!) Dinner was delicious with a menu packed full of goodies from fresh local seafood through to steaks and vegetarian options. I will be going back with family for a holiday as this was business! "Biggles LOVES this amazing place!" We have just left the kinloch hotel after a fabulous 2 night stay with our dog Biggles. We couldn't have been made to feel any more welcome. Although our room was a little dated and could have done with a bit of tlc in the bathroom (the loo roll dispenser required a bit of contorting to access while on the loo) everything was spotlessly clean and everything we could have wanted was there. We stayed on the 2 night package with ferry crossing and dinner on the first night included and also a bottle of prosecco in our room. We ate there both nights and were made to feel very welcome in the public bar with our dog. Biggles was also well catered for and flirted with the staff so he could get biscuits!! The service and friendly welcome we received was better than some 5 star establishments we have visited. Thankyou so much to all staff for making our stay so great. Booked this through Groupon. The staff were very friendly and they couldn't do enough for us. The room was lovely with a view over the water. We ate breakfast, lunch and dinner there and the food was lovely. We didn't use the swimming pool. I stayed here with my young family over three nights in October. I cannot recommend the Kinloch Hotel enough - the staff were absolutely superb, and were brilliant with the kids, particularly my two-year old who was presented with a bespoke Peppa Pig ice cream for her dessert one night. It's not easy taking two kids on a break, and the hotel did absolutely everything to accommodate us. Great food (excellent breakfast), comfortable accommodation and superb facilities. We will definitely be back. "Great bar in fine location"
Loved the real ale here. The location was outstanding with fantastic views. The wonderful golf course at Shiskine was on the door step. Highly recommended for very good service. Loved old photograhs in the bar area. "Lovely hotel by the sea"
Came for a long weekend, traveling from England. We were on a package deal. Have to say the service was exceptional, all staff were tremendous, friendly courteous and pleasant, have not been to a hotel for a long time with such friendly staff. We did have a issue the hotel , is being refurbished, and only seven rooms have still to be done. We unfortunately we had one of the rooms still untouched, room 19 . This room should really be closed off, as it's unacceptable, unfortunately as they were fully booked, they could not move us until the Sunday. So we spent two nights in room 19. The room they moved us to eventually was lovely. But we should not really have had to pay the same rate as the people in the nicer rooms.as our room was sub standard. That's why I've only rated it very good. As everything else was first class. Including the food.Would return and still recommend as I'm sure the other seven rooms will be updated soon. Lovely area as well, Special thanks to the lovely receptionists plus the owner/ manager for eventually rectifying our issue. "Nice light lunch after a walk with friends to the Kings cave"
We were not resident but called in for pre-booked lunch after a pleasant morning walking. Every thing went to plan and the staff had our table ready,service was excellent and the meals light fresh and not expensive. What a lovely hotel with such a friendly and helpful staff. It had a lovely comfortable atmosphere Our room was very spacious with lovely views over to the Mull of Kintyre. There was easy acess from our room to a small carpark, which was ideal as we had the dogs in the car. The dogs were also made very welcome in the public bar. Dinner was so delicious, we had a fish platter to share with salad and artisan bread, the assortment of fish and shellfish was incredible. We will definitely stay there again! "Great re - furbished hotel with fantastic location on Kilbrannan Sound"
We went to the hotel for dinner as we were staying local. My dad, daughter and I all had the fish and chips that were very fresh with lovely crispy batter ! The service was very friendly / efficient and helpful. Lovely end to our stay on such a lovely island. Three adults for dinner on a week day having pre booked. We were not resident. Very attentive friendly service. Food served promptly with a smile. No description of the tasty food in this review, just a totally enjoyable experience throughout. 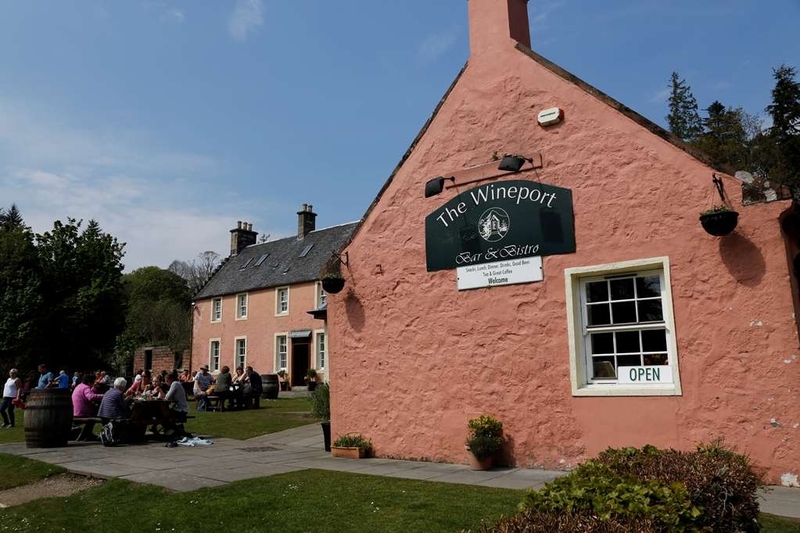 Great value for money from an extensive menu and a spectacular views across to Kintyre. We have booked a table again in September for our second visit to Arran. "Location and staff made for a great break"
This hotel has a fabulous location - right on the coast and with easy parking. We had a beautiful sea view from our room. Our room and indeed the whole hotel is pleasant and clean. We had dinner in the hotel on 2 evenings, I'd class the food as ok rather than outstanding - plentiful portions though. The staff were really helpful and welcoming. Recommended on balance! "heaven on earth in a suite overlooking the sea"
Spent three nights here the hotel has a lovely outlook over the water, room was really clean with little extras like shampoo body wash soap etc. The staff are friendly and helpful, food was good with a good choice,could not fault it and would recommend it. I recently [August 2017] stayed at the Kinloch Hotel for 4 nights as part of an organised bus tour. I found the hotel very clean and well decorated, and with a lovely cheerful atmosphere. I had breakfast and dinner in the hotel. The standard and choice of food was excellent and the dining room staff were efficient and friendly. My room was a single at the back of the hotel but because the sea views are so spectacular it would be better to have a sea view, even if it cost more. I loved this hotel and wish I was still there. "lovely way to spend a few days"
Here for Coffees and snacks. Hotel set in a lovely location, overlooking the water. Looks recently refurbished, very clean and nicely decorated. The local Staff were very friendly and welcoming. Would recommend. Just back from a couple of days at the Best Western Kinloch on Arran. Blackwaterfoot is the main village on the western side of the island with uninterrupted views accross to the Mull of Kintyre. And these are the views you enjoy all the time spent in your west facing room at the Kinloch. It is a really relaxing hotel with comfortable rooms and spacious public areas including an indoor pool. Breakfasts are wonderful. Large choice and beautifully fresh. The island itself is very laid back with one main road which more or less follows the perimeter and can be driven at a leisurely pace in around 90 minutes. It takes in all the main villages and island attractions as you climb up from and roll down to the various bays amid beautiful scenery. 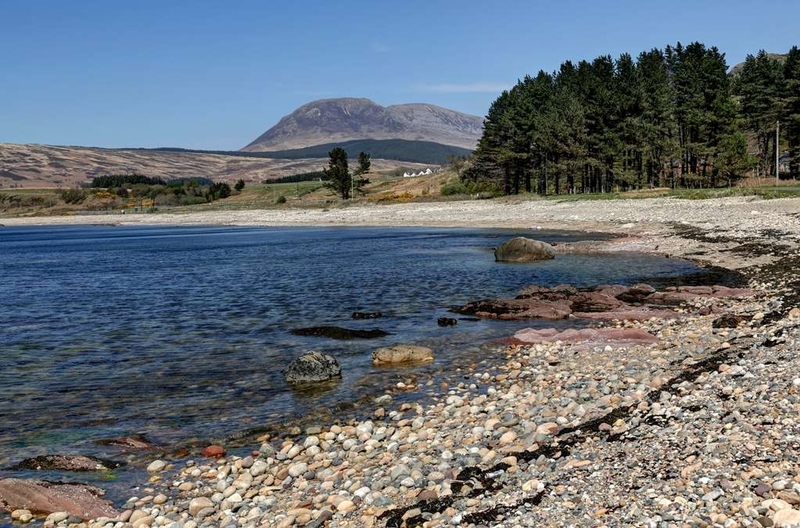 The other main route goes accross the island with stunning views of Goat Fell and the Shishkine Valley, joining Brodick with Blackwaterfoot and Our hotel package was a ferry crossing inclusive deal and the sail from Ardrossan to Brodick was comfortable, relaxing and thoroughly enjoyable. All in all a smashing break. Great Scone, Great Tea, Great Service, Great view but on what planet does a cream tea come with squirty cream from a can!!! Management should be ashamed as from what I could see all the other food looked wonderful. On an island with excellent jam the plastic catering carton was a bit disappointing too. This is our 16th consecutive year of coming to Arran, and the Kinloch. Always get the best of personal attention from all the staff. Double rooms overlook the sea and across the Kilbrannan Sound to the Kintyre peninsula. Very well appointed. Comfy huge beds. Hot shower and bath and lovely heated towel rail so you can wrap yourself in warm luxury towels after your shower. Blackwaterfoot has a post office/general store, butcher's and harbour shop selling newspapers and gift items amongst many other things. Shiskine golf and tennis club is a brisk 5 minute or leisurely 10 minute walk away. However if it's nightlife you're looking for it's probably not the ideal spot for you as by 10 o'clock most folks seem to have taken to their beds. We stayed here for 2 nights at the end of our annual holidays and I don't think we could have chosen a more tranquil place. The hotel itself was very well run, clean and efficient. Breakfasts and dinner were excellent. It's the perfect place to go to for a relaxing stay. The views are stunning and the evening, given fair weather, seems to be a time for going outside with a glass of wine and sitting on a bench, chair or the beach and watching some of the most beautiful sunsets imaginable. Despite living in Scotland all my life, this was my first visit to Arran and certainly won't be the last. Stooping in Shiskine for a week. Used the hotel for dinner 3 times. Curtious friendly helpful staff, beautiful views of the scenery through huge windows and delicious food served in a very nice restaurant. Good choice of food on the menu Need to book, 10% off between 17:00 - 18:00. We booked 3 nights as a family of 4 with 2 children age 7 and 10. From the word go the staff were exceptional going out of their way to help (shout out to elizabeth on the bar for the loan of her iphone charger). The hotel has recently been refurbished and is so warm and inviting. The lounge, dining room and breakfast room all face the sea so its relaxing to have a meal and look out. We had room 23 which was a turret bedroom with a side sea view. It had a massive double bed and 2 beds setup for the kids. Everything was spotless and the housekeeping staff were all lovely even folding the kids pjs onto their pillows for them. Meals were pretty standard i think this was maybe the hotels only very small let down my first meal in the evening was obviously microwaved as it was cold on top and hot on the bottom but a second meal was fine so it wasnt worth complaining over when everything else was so great. We also used the swimming pool which was very clean and the squash and snooker rooms which the kids adored and tired them out at night before winding down. The hotel has several little shops around including a post office which was useful and lovely artisan bakery. We loved every minute and wont hesitate to come back soon. (Also shout out to liz in the breakfast room as she was lovely and very helpful regarding things to do in the area). went here for an evening meal on the last night of our holiday. Food was well cooked and plenty of butterscotch sauce on sticky toffee pudding. staff were great and very helpful. If you go between 5 and 6 you get 20% off your food bill (but not drinks). Can get very busy so essential to book in advance. "Great hotel, would go back"
11 of us were here for a birthday celebration. The dining at The Kinloch is very good. Breakfast is good & we hade a 3 course dinner one evening with vegan/vegetarian & meat eaters, with everyone well catered for. The staff were very friendly & helpful, no complaints at all. The only thing that was a bit disconcerting was that it seemed very warm everywhere in the hotel, uncomfortable for sleeping. Overall, definitely a very good hotel & the deal we had with free ferry travel/discount on evening meal & free bottle of proseco was brilliant. Two nights bed and breakfast at the Kinloch Hotel, Arran. Location is brilliant - right on the waterfront. Staff very friendly, food superb and the room is very well presented. We brought are two dogs and could not have been happier with the way in which they were welcomed too. All in all a fantastic weekend. Image is the view from our room. Really enjoyed our stay here. All double bedrooms face the sea - and the windows are kept spotlessly clean. Rooms are spacious and well equipped. A large double bed and again, everything well maintained and clean. Breakfasts are surprisingly good, with fish to order and a breakfast buffet including haggis, black pudding and square sausage - everything kept fresh. Evening meals are also good and good value - as are drinks in the bar. The hotel has its own car park at the rear - not well advertised. The free car par at the front actually belongs to the council. We will be returning. My family and I come to Blackwaterfoot every year and love it so much we immediately book up on departure for our next year's stay. We have been coming to the Kinloch for years and I now bring my young grandchildren who also love it. "Why can't hotels always be like this?" Location is truly unique, for us the best position on Arran (and we circumnavigated), the management have got it just right, bedrooms are comfortable with stunning views, the food is excellent, the staff are exceptional and the sunsets are indeed outstanding. Look no further - and they do a great deal, packaging car ferry, passangers and hotel accomodation for a very reasonale price. It was our first visit to Arran, won't be our last - but we shall return to this Hotel. Downside, although it is walking distance to the Shiskine Golf course but we failed to bring our golf clubs! "Great hotel on a wonderful island!" Could not be any more pleased with our stay at the BW Kinloch. Great location, comfortable rooms, great amenities, good food, outstanding service... and wonderful scenery. A fantastic part of our tour - wish we had planned for a longer stay here on Arran. We will be back! Stayed at the hotel as a family of two adults and two children (11 & 7) in half term. We had a two bedroom self catering suite but ate breakfast and dinner in the hotel each day. The hotel was superb. We used the swimming pool each day and the room was clean and very comfortable. We were lucky enough to have a view across to the Mull of Kintyre and it was great just to sit and watch the view. The food at both breakfast and dinner was very good and the bar was well stocked and reasonably priced. The owner/manager, Robbie made us all feel very welcome and seemed to be working all the time! The only suggestion for improvement would be to create a small gym area with a running machine etc for times when the weather is really horrid outside! The hotel has been brought up to date in the lounge/bar and reception areas and rivals some of the 4* hotels we've stayed at. Very friendly staff , food is great and the self catering flats are a home from home. Well done, Kinloch. "A relaxed and enjoyable overnight stay"
A wonderful place to stay. The staff were unbelievable helpful and always cheerful. The room was large and the view fantastic. Evening meal was good and well presented and the price very reasonable. Breakfast choice was excellent. We wished we were staying longer but this was just an overnight on the way to Islay. Could not fault the hotel or staff, excellent all round. Location is exceptional. Food was a very high standard particularly breakfast. Great variety and sevice. View from room was great. Would definitely recommend. "Comfortable hotel in stunning location"
Great place to enjoy lovely Arran. Good, hearty bar food. Comfortable bedrooms with great sea views. Lovely swimming pool with sauna. Shore location with beautiful views over to Kintyre. Friendly staff and lots of things to do in the area. We spent a relaxing two nights, enjoying delicious dinners and the house beer. We also took advantage of the pool and sauna. Staff were all friendly and helpful. The inclusive B&B, dinner allowance on one night and ferry fare made this a great deal. Took advantage of the 2 night Ferry Deal offered by the hotel. Stayed an extra night, for which they gave additional discount. Room (33) was adequate in size and decor, but clean and had superb sea views. We could see seals at low tide and lots of oyster catchers - take binoculars if you go. Staff seemed all from local area and very friendly/efficient. We ate at the hotel on the first evening and food so good we ate there all three nights (same menu, but plenty of choice). Very nice indoor pool used only the once - weather was dry! Good walks from the hotel alongside the Shiskine Golf Club and also in the other direction, where lots of flowers and different birds to see. A jewel. This hotel was our base for a coach tour . the hotel is located in a very nice area,quiet and on waters edge.The rooms may look a bit tired to some people,but this does not affect the standard of cleanliness.our room was overlooking the water which was lovely as we could virtually see the sunset from our room.the hotel catering for a coach load of people every breakfast and dinner,had it down to a t,the menu was varied and food was excellent.the staff though must top the bill as they were a credit to the hotel. There is a bus stop outside the hotel, which we used a couple of times and found to be very good ,but your journey has to be a bit planned as they are not frequent. "A well appointed hotel with wonderful staff"
We stayed there for two nights taking advantage of their Ferry Deal and were glad we did! Not only was the room we stayed in top class but the view from the window was superb. The hotel has been recently renovated to a high standard as have the swimming pool and sports facilities. Our corner room was sparkling clean and looked as if we were the first ever to stay there. The beds were comfortable and there was no noise at all from any source so we enjoyed a couple of wonderful nights' sleep. We booked our evening meal in advance the first night expecting that we would go elsewhere the second night, but it proved so superb that we dined there again. All the staff were friendly and helpful and couldn't do enough to please you - a rare enough occurrence nowadays! As noted by another reviewer, they were very smartly dressed and very polite had a pleasant smile on their faces. This is a hotel we shall definitely visit again and one I cannot recommend too highly! "Superb Food and Beer at Reasonable Prices"
All the staff have a smile on their face,tells you a lot,they are happy to be there. Helpful,friendly and very smartly dressed,we were so impressed with their nothings a bother attitude. 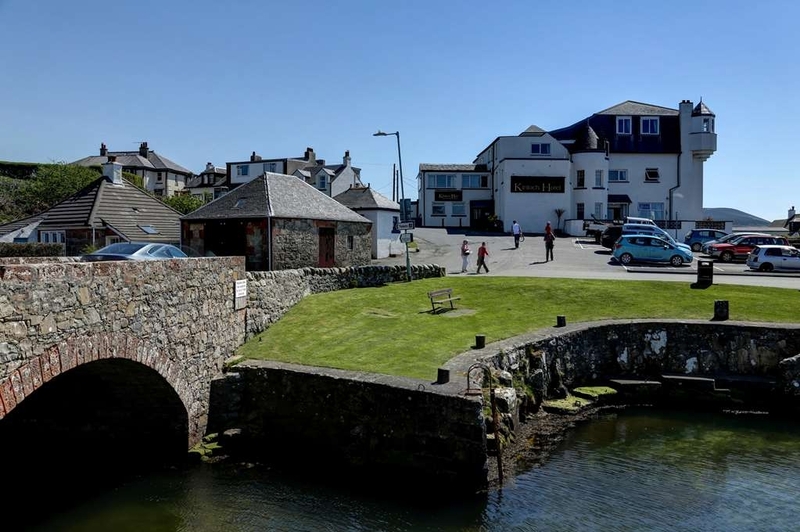 The hotel is in a stunning location, with views over to Kintyre,plenty parking spaces,and a very regular bus service to all parts of this beautiful island. The food is lovely,all of it,served in a lounge area with an amazing view,the rooms along the front are spotless,comfy beds,and offer sea views,there is a wonderful indoor pool too, it is a very good size,and again,so clean and welcoming. I must just add, so many thanks to the fabulous staff,who made our stay one to remember,will we be back, you bet,very soon. Thank you Kinloch,for such a wonderful stay with you. The staff couldn't have been more friendly or helpful. They also worked very hard! Looking as though it has had a recent updating of furniture and fittings in the public areas, if you're heading this way don't hesitate to book. Wonderful sea views. Recently spent 3 nights at the Kinloch Hotel and we could not fault it. The ambience, the food, the room (14) with a sea view and the terrific staff who never failed to smile at all times and found time to communicate with residents even when busy. We were on a 7 day/6 night two hotel coach tour of the Islands (Arran, Mull & Iona). The Kinloch Hotel knocked spots off the second hotel that we stayed at in Oban. We would not hesitate to highly recommend the Kinloch. Well done to ALL the team. "Third visit and not the last." This is one of the best small hotels I have ever stayed in. Third visit and will not be the last. Friendly and efficient staff, good food and large portions. All rooms and public areas are clean and bright. Small swimming pool with changing rooms and towels provided at reception. Lovely walks along the seafront in the evening and often seals lying on the rocks. Only negative was the heavy rain on the day of our arrival. We used this hotel as a restaurant. The service was very good, the food was lovely and not too pricey. We had a good bottle of Sauvignon Blanc. The decor was soothing and pleasant with a touch of tartan. I would recommend it to anyone. We met our friends in here for a drink. It is a lovely hotel. Very clean and tidy. Plenty of information about the local area. Staff are very friendly and helpful. Prices are reasonable. Great parking. Fabulous views of the sea. Public transport right outside. Would highly recommend this place. If you are looking to be well fed, well treated and want to relax and be looked after then this is the place to be. We were lucky to experience fantastic weather which enabled us to appreciate the wonderful view from our room and the hotel dining room with fabulous sunsets and watch seals and gannets. Go for some great walks, enjoy the swimming pool which has good changing facilities with warm flooring, not the usual cold wet slippery tiles. Every member of staff we encountered were helpful and attentive. "A lovely hotel in beautiful location"
This hotel has the most stunning location , we stayed in April when there was an offer for sea view room , 2 nights bed and breakfast and one night dinner for two plus ferry crossing for 2 and car included ( March, April and May offer) and this was great value for money. We saw beautiful sunset from our hotel and the evening meal was excellent with the staff ensuring that we were provided with a choice in a variety of vegetarian meals ( something we find rarely) . Pool is great and the staff are extremely friendly. Would highly recommend. Have just returned from a two day break at the Kinloch hotel Blackwaterfoot Arran. Can't compliment it enough for the quality of the hotel, the excellent food and most of all the friendliness and efficiency of the staff. Had a wonderful break at the Kinloch Hotel Blackwaterfoot Isle of Arran, the reception from the staff was warm and welcoming, room was warm clean and comfortable. Dining was very good meals were very good and varied, waiting staff were very attentive and service was excellent. Hotel facilities were great with swimming pool, squash court, and snooker available. All in had a wonderful stay at the Kinloch and would recommend this hotel. I have just returned home from a fantastic break at the Kinloch Hotel. Couldn't fault it at all!! I stayed for 2 nights over the easter break with my partner. We had a beautiful room which was made even better due to the stunning sea view. We ate in the restaurant both nights, and the food was excellent. We then had drinks in the bar afterwards, which had a great atmosphere. The staff really make this place as they couldn't be more helpful or accommodating! We got told they had recently refurbished a lot of it, with more to come. We can't wait to return on our next trip to Arran. Definitely recommend to stay here for a weekend away. "Love this place! Will keep returning!" Just spent a week over the easter holidays with my husband and two small children. We have been coming to the Kinloch for a few years now and are never disappointed. This year we walked in to an amazing ground floor refurbishment. One word - WOW! Absolutely amazing! Really classy, decor that is so homely and inviting and those amazing huge windows that draw you to gaze at the sea......superb! There's a newly created foyer kind area that was great for sitting in and reading a newspaper/book.....whenever my kids let me that is!! I also liked the new addition of a guest laptop - you get access from the reception area and on you go, great for planning days out and all complimentary! The swimming pool has also had a face-lift and is just great! Really warm and clean and I literally had to drag my children out of it each day!! One minor "whinge" would be that the dining room is looking a bit tired, but I was talking to the girls on reception who were telling us that next winter will see the dining room being upgraded and more. So good to see this family hotel doing so well. The staff are lovely and I really cannot explain how nice it is to have them take a genuine interest in you and your holiday plans. Nothing is too much trouble and they always have a smile on their faces! Until next easter Kinloch, see you then! We had lunch in the bar with its stunning views. The recent refurbishment is very nice. The food was excellent and the staff very friendly and efficient. The management obviously care about their guests. We'll certainly go back. Lovely setting. Great coffee and lovely scones and carrot cake. Only reason not given a 5 was the toilets. Could be better. Clean enough but lacking in luxury that public parts of the hotel led me to expect. "Nice homely place for a break"
Six elderly lads on a cycling weekend. There is a good pool, refurbished bar in the hotel (the public bar is a bit of a dive), good sized rooms and excellent dinner and breakfast. the staff couldn't be more friendly, and the cost of one night was stunningly good value. The restaurant has a rather old-fashioned air, with some Edwardian sideboards which look just out of place, (to be refurbished, apparently) but we were very well looked after. We have just returned home from a having spent the weekend here & I have to say we had a brilliant time,we were here the same time last year & liked it so much we booked again, we saw a lot of changes with the upgrade & what a difference it made,obviously still more going to be done but it's lovely. Eleanor was lovely & helpful as usual, what a view she has now in the new reception area, Robbie still popping up everywhere too & a couple of new members of staff as well, Louise serving the meals last night was lovely & I have to say ALL the staff are so helpful. Our meals were of good standard & everywhere spotless,so hoping to return next year. "Just a great family hotel"
I would definitely recommend this hotel to anyone thinking about a stay in Arran. Plenty of reasons for this: Location, location, location: Blackwaterfoot is the most beautiful village on the island and the Kinloch is perfectly placed looking out to the ocean, you can see seals in the bay from your windows most evenings Hotel Amenities: there is a small but clean and well cared for pool, sports rooms and wi-fi throughout. 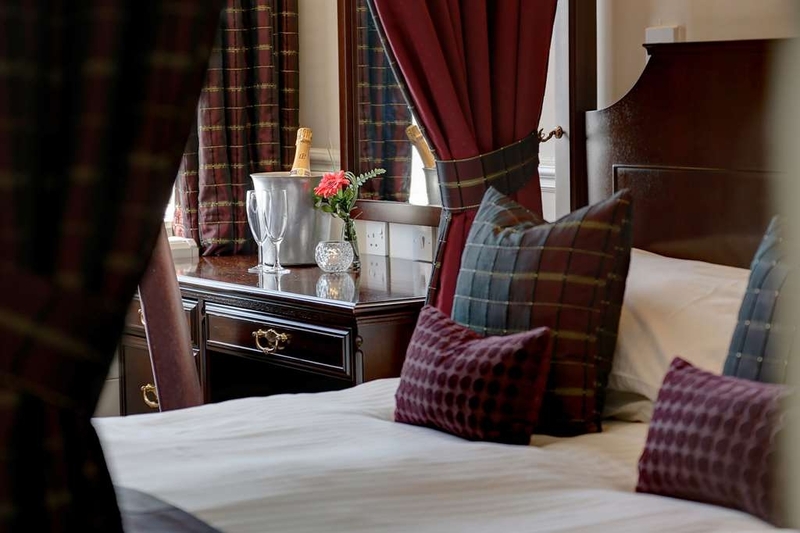 Hotel appearance:rooms are clean, decor is fairly neutral but with some nice Scottish Colourist portraits and local views in the dining areas. It's not the Ritz but it has personality and everything works. Food: buffet breakfast is great, plentiful supply of everything with a smile and evening dining must be booked in advance as the locals eat here too. Staff: exceptional, everyone was friendly, helpful and genuinely cared about our time there. There was a large student body staying in the hotel at the same time as us and its to the credit of the staff that we barely noticed them- they were expertly managed as a discrete group. In the hotel were toddlers, couples and pensioners all seemed to be enjoying themselves. "Great views and food to boot "
We had travelled round the island looking for somewhere to lunch. Most places were either shut, full (not many) and some had a power cut. We arrived at Blackwaterfoot and came across the Hotel. You can't miss it BTW it dominates the village. The options for food are varied. You can either snack or have lunch during the day. They are very versatile and the food is excellent. The staff are very personable and friendly. Oh and the views are breathtaking. Well worth the visit. I had an overnight stay at the hotel and found all the staff to be extremely friendly and welcoming. Even though they were busy, they made time for every customer. The location is excellent, very peaceful and you could happily sit enjoying the view. Although some aspects of the hotel were a bit tired and could do with an upgrade, the hotel was very clean and the room was fantastic, with a fab sea view! Great big comfortable bed, the room was lovely and warm and had everything we needed. Buffet style breakfast was on offer and you could also order additional fresh cooked food. I would recommend this hotel and will be returning again. Have no complaints at all. A weekend deal seen in our local paper, this included two nights bed and breakfast with dinner on the first night, return ferry and the most amazing carrot cake with coffee in the afternoon. Our room was adequate with a magnificent sea view, and large comfortable bed. The staff were very friendly and helpful. The food was excellent. To top it all it was 5th November so we were treated to the most amazing bonfire and fireworks display including soup. Will definitely return. "Blackwaterfoot but not the Blck Sheep"
I visited the hotel for a weekend break with my best friend and my dog. The hotel itself isn't the 'prettiest' and could do with some freshening up in regards to decor in the bedrooms, grouting in the bath etc but it is set in a stunning, quiet and peaceful setting. With the beach on you doorstep you are spoiled if you have a sea view. Our initial welcome was a bit ropey (I'm used to the 'good afternoon, welcome, have you stayed with us before' intro speeches) but other members of staff soon made us feel more than welcome. At £10 per night extra for my dog I struggled to see why exactly I was paying for but was still greatful to be able to take her with me. The only public area dogs were allowed in was the bar. I understand this when food is being served but they serve food in the bar area too. Just a little odd. Dinner on the first night was superb; both scallops and steak cooked to perfection. The second night I wasn't so lucky. They mixed up our orders and my steak was tough, over cooked and a really bad cut. I at £20 it was too expensive to put up and shut up and was sent back. The staff were lovely and it was quickly replaced. Breakfast was buffet style self service. Plenty of choice and certain things could be ordered fresh. I was a little unsure why fruit was one of the items that had to be ordered; again, it just seemed slightly odd as most hotels have their fruit basket on display with the cereals/continental breakfast items. All in all we had a fantastic weekend and putting the little niggles aside I would recommend the Kinloch Best Western as a family and dog friendly hotel. "Walking Group Long-Weekend on Arran"
A very nice quiet hotel in a great location on the waterfront at Blackwaterfoot. Beautiful walk from the hotel along beach and edge of golf course to Kings Cave. A wonderful relaxing hotel for a weekend or longer. Stayed here with 37 members of Rambling Group - would recommend. My wife and I thought this hotel was superb value for money, room with a sea view was requested and granted to us, room was immaculate and nicely decorated, a heated swimming pool in the hotel for residents to use which we utilised.Also our 2 night stop over with breakfast was very tasty and they had a good choice on their menu. We would have given everything about this hotel including the staff marks of 10/10 if it had not been for 1 particular staff members attitude towards us on our last day at breakfast time. Maybe Stephanie was having a bad morning. We will most definitely return in the near future! Oh!! A big thank you to the barman for suggesting I try the local brew Cally 3 hops as there isn't Tennents Lager. Visited for lunch with family. The food and staff were lovely and extremely helpful. However the atmosphere spoilt by a terrible radio station feeding directly into the bar. The music was loud and was very distracting. Spoilt it all a bit. The KINLOCH Hotel at Blackwaterfood, Arran was outstanding for cleanliness, facilities and staff, we were on a two night break and thoroughly enjoyed every minute, our seaview room was lovely, the food was great, good all round breakfasts with lovely views across to Argyll, the evening meal was first class and the service was excellent. Stopped in here for an afternoon cup of tea after a walk round the village. The views were breathtaking. The cakes were amazing and the tea, coffee and hot chocolate were great. Even although the place was busy, it was not noisy. You could hear the conversation at your own table without having to strain. The staff were very welcoming. They even acknowledged us as we were leaving, which is a nice touch. ...to our nightmare when we checked into another hotel on Arran that claimed it was the Islands best hotel. Arriving at Kinloch Hotel we were greeted with a genuine and warm smile, a host of information regarding the island. We enjoyed our 2 nights so much we extended to 2 more. We will be back again in the Spring! Thank you. 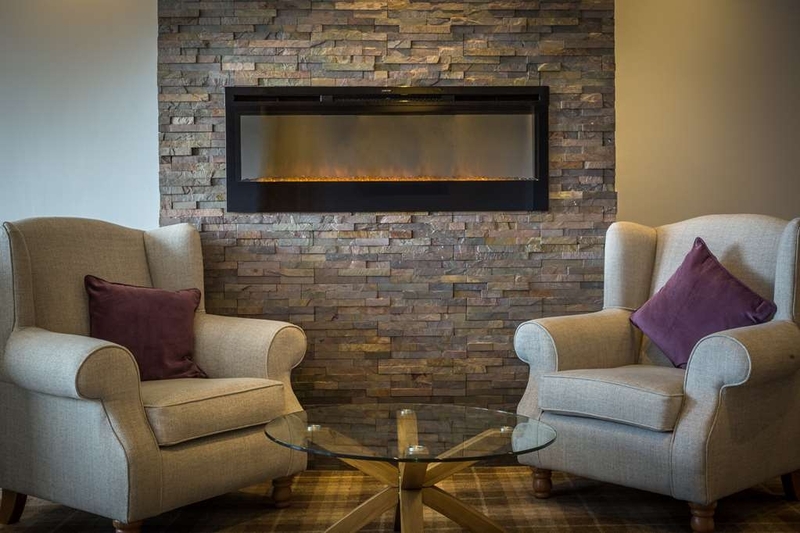 "Excellent locaion, excellent customer service"
3th time at the kinloch, we had a probem with our room, the receptionist dealt with the problem quickly and without fuss and upgraded us to a better room, food as usual was fantastic, especially breakfast. The only negtive i have is the pool and surrounding area is now looking very tired and in need of upgrading....this may be in the pipeline??... overall a fab hotel and we hope to return. Had an excellent stay for 2 nights with 3 children and a dog - hotel is situated right on the water and was easy to get to. Food was fine, our room was lovely with plenty of space and the decor is nice - kids loved the pool and flying kites on the grass at the front of the hotel and we will certainly return. One downside was poor water pressure in the shower but that small quibble aside it was great. Staff were excellent throughout. I found the whole experience excellent. Staff were professional and very attentive. The rooms were excellent. Beds very comfortable. The outstanding view was the "icing on the cake." Superb food. Staff supportive looking after us and all our golf parafanalia. I would highly recommend this hotel and will certainly be back. 3 night stay in this lovely hotel. Perfectly situated to explore the island. Room was everything I expected it to be, very comfortable bed, good quality fixtures and fittings and a clean bathroom. Hot water was a little erratic but otherwise perfectly acceptable. Breakfast superb, great choice and service performed outstandingly by the staff and led by Robbie, a great asset to Best Western! Evening meals superb (except the dire mushroom burger), again excellent service and comfortable surroundings. The pool and sauna were perfectly acceptable, both clean, functional and a welcome addition on a rainy afternoon. This Best Western hotel is great, do not hesitate to book, they should be proud of their level of service. "Privately-owned hotel within the BW franchise"
Stayed here for six nights on a B&B basis which included the cost of the car ferry. Despite being a little tired around the edges the owners have done a good job in trying to keep on top of repairs and most areas have been progressively refurbished in a sensible manner - nothing ostentatious or that would cause the prices to rocket but in keeping with the general ambience. With safety and energy efficiency in mind the electrics appeared to have been renewed throughout. With the exception of one or two corridors which are narrow and compact bathrooms where the toilet roll dispenser is where one's elbow would normally be, the facilities are spacious and comprehensive. 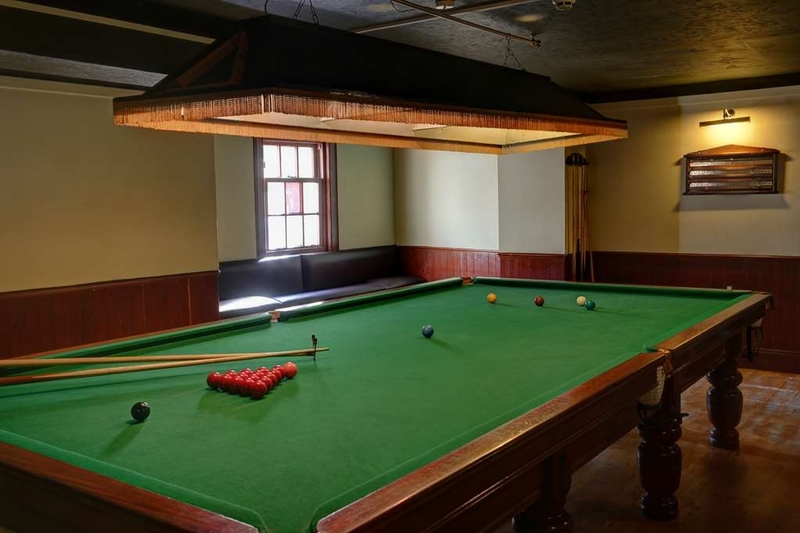 Where else can one expect to find a full-size snooker room (c/w with a decent table) available for guests use? And there's a swimming pool. And a sauna (albeit set up for English rather than Scandinavian tastes, ie not too hot and with light levels akin to an operating theatre). The breakfast offering is as wide as one could possibly hope for; nicely cooked (some items to order, such as haddock or kippers); and if the staff can help with anything else then they will. Indeed the helpfulness of the staff generally is one of the hotel's best attributes, and the management is to be congratulated on running what is clearly a happy ship. We enjoyed our stay at the Kinloch. We turned up without a reservation, but they fit us in with typical good Scottish hospitality. Food was good and moderately priced. We had a good conversation with the couple next to us and had a mutual acquaintance, which was a bit mind blowing. I would certainly eat there again. We stayed at this hotel whilst on a holiday in Arran organised (very well) by Brightwater Holidays. They chose well; it is a very good hotel and one we would be happy to return to. The room was clean and comfortable and the food of high quality. Service was at all times quick, efficient and the staff uniformly pleasant. There is a large bar and restaurant inside the hotel itself and also another bar with access straight from the street. Hotel guests have their meals in a separate dining room. 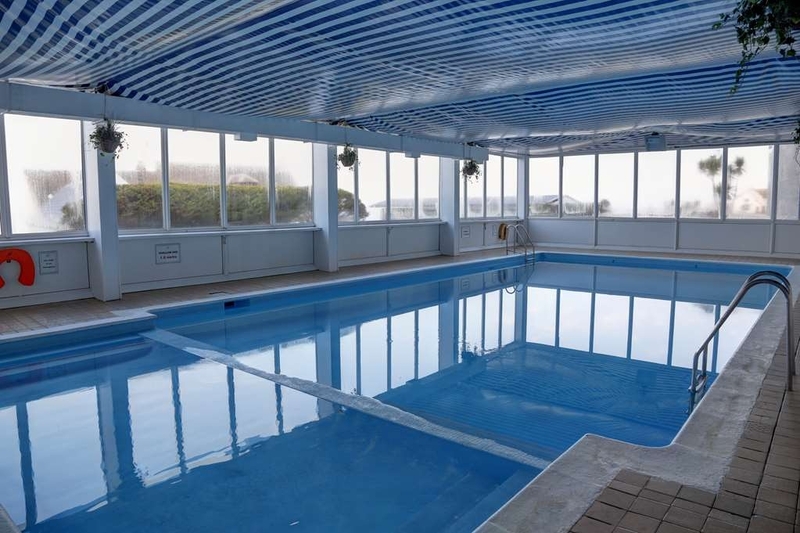 Other facilities include an indoor swimming pool (considerably larger than the ones generally found in hotels), an events room, a squash court and even a billiards/snooker room. We did not have time to sample any of these but they all looked to be clean and up to date. The older main hotel building has a lift but the newer part does not seem to so if you need help getting to the upper floors request a room accordingly. The hotel is on a bus route round the island and also has adequate parking for those who take their cars across on the ferry. "Superb location brilliant staff and excellent food"
Delicious vegetarian lasagne with focaccia bread and dressed side salad (only downside was that I couldn't finish it all) and my husband had a very substantial beef burger in a bun with chips. Attentive and friendly service. Pleasant atmosphere. "Just like being with family!" We had an amazing few days here. The staff fell over backwards to make sure we had everything we needed. Our room had a lovely view over the water to Kintyre, the room was spacious, well equipped and with another lovely large bed. Breakfast was excellent (with some of the best black pudding ever) and we all had some very good dinners, especially the lamb shanks and seafood platters. We will be back! We have visited this hotel many times over the years and it never fails to please. The staff are friendly and can't do enough for you. The choice and quality of food is excellent. Well worth a visit as is Arran itself. Lovely location, spectacular views, tasty and well priced food, spacious rooms and friendly staff on an absolutely beautiful island made for a pretty amazing visit. Although we booked late for the August Bank holiday and ended up with the last available room the staff were so helpful in accommodating us. You really get the feeling they enjoy and take pride in working at the Kinloch Hotel. Upon arrival we discovered our room still had a sea view and it definitely did not feel like the last available. Facilities were clean and although the hotel had a slightly dated feel overall it suited it and any negatives really would be nitpicking but here goes anyway: slightly later restaurant ordering times would be appreciated, as would a swimming costume dryer in the changing rooms. As I say that really is nitpicking and I would definitely stay here again, in fact I will be for my birthday and will be bringing friends and family aswell! Friendly staff, nothing too much trouble. We usually love the fish and chips and make a point of visiting each time we go to Arran. Unfortunately this time the fish was a bit soggy.... But we still enjoyed the visit. We spent 3 nights over bank holiday weekend, wonderful stay. The hotel is situated in the perfect place with beautiful views. The hotel is spotlessly clean , super king size bed with bath and shower in the bathroom. Food is amazing and reasonable priced. Swimming pool is lovely and relaxing before breakfast. All the staff were friendly and welcoming. We really enjoyed the mackerel lottery in the pub on Sunday and we're lucky to win several decent prizes. The isle of Arran is a beautiful island with stunning views and a real relaxing experience. I would recommend the hotel to anyone young and old !! Fabulous location on the beautiful Isle of Arran. 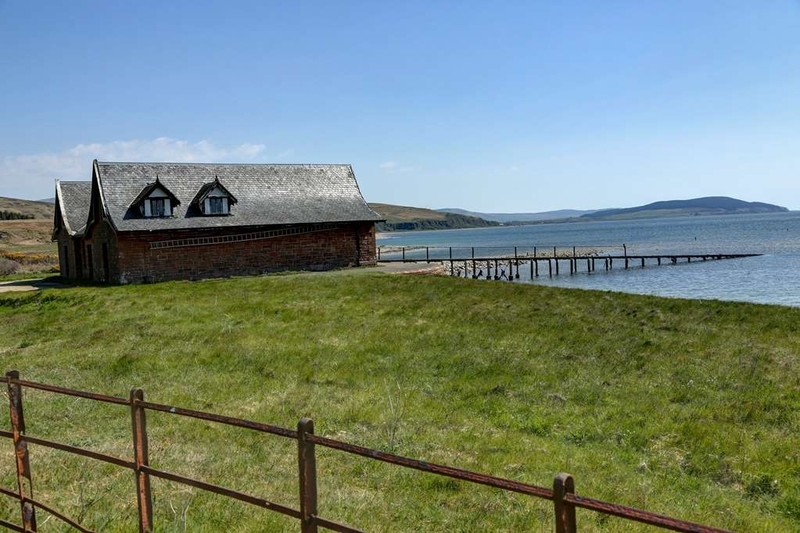 Right down on the shore with wonderful views across to the Kintyre peninsula. Comfortable and clean with very pleasant, helpful staff. Food excellent and bar sells good range of ales, not to mention local whisky. Free wifi throughout hotel with separate internet room. Also has 24hr laundry room with washing machine, tumble drier and ironing facilities, free of charge. Indoor pool and leisure/spa facilities available. Comfortable and well priced stay. 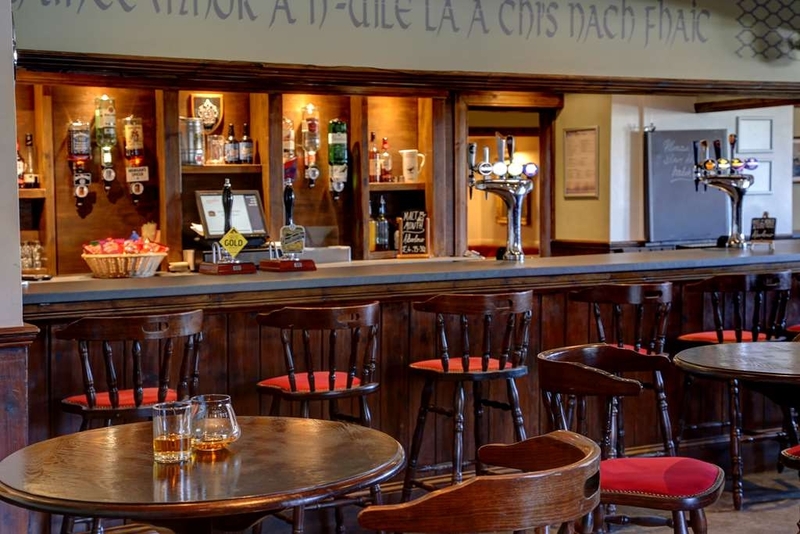 Clean throughout, helpful staff and a good range of quality cask ales on offer. Evening meal was excellent with a generous portion and well presented. The hot smoked salmon & crayfish salad was best meal I've had for a long while! Lovely hotel - genuinely friendly and welcoming staff. I stayed in a single room which was much bigger than expected and got the view I'd requested at no additional cost. One of the most comfortable beds I've ever slept in! I'd definitely stay again. I visited here with my family in July, the hotel is very classy and the lunch menu is good and reasonably priced. I had the club sandwich and lentil soup, it was very tasty and the soup was lovely. Blackwaterfoot is a lovely place and this is a great lunch venue if you visit. "Really decent hotel at a decent price"
We were on the second floor with a fantastic view and our room was really nice and big. Everything in our room was spotlessly clean and sure it's a little dated but when it's clean and roomy I never ever mind. The TV is some distance from the bed or perhaps my eyes are going in my middle age and the little biscuits were not replaced each day but these are mere little things. I thought the dining room (the proper one) and the service were super and the menu choices varied and clearly home made. I thought the breakfast was a little spartan if you don't want a hot buffet selection. It would have been nice to have more fresh fruit, a different selection of breads, hams, cheese, hard boiled egg etc with some honey and nicer jam but none of this would make me not return, nor recommend the Kinloch BW as I thought it was a somewhat traditional, very friendly, very service oriented hotel. Clearly well managed, that is for sure. Thanks for a great trip. 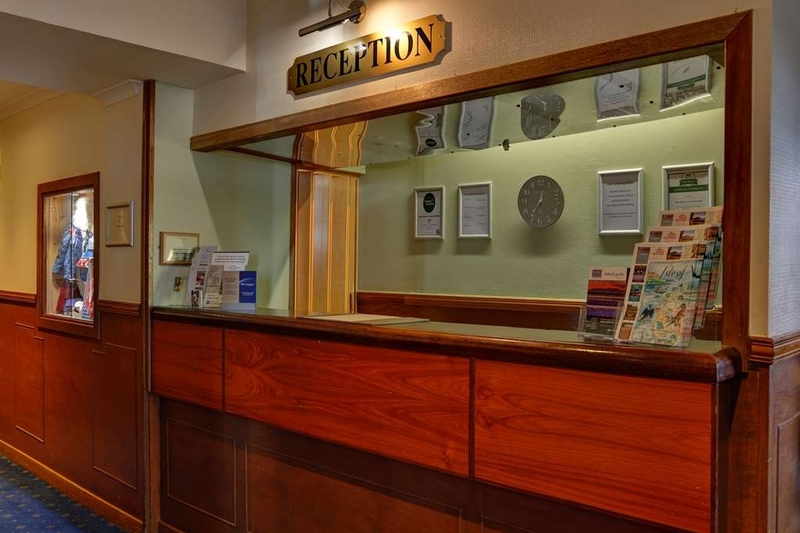 On arrival: Very quick & efficient at reception, hotel immaculate & traditional decor throughout. Plenty of car parking spaces. Location: Blackwaterfoot (Approx 10 mins drive from 'centre' of Arran (Brodick). Nice not to be in the busy area. Lovely sea views, golf course/walks right on your doorstep, grocers', post office, butchers etc all there too. Beach was about 30 seconds walk away, Room: Immaculate, super kingsize bed, table & chair, phone, hairdryer etc, toiletries supplied etc. Service: Very well staffed, majority were young, ALL very professional at all times, hard-working (Never saw any of them messing about/on phones etc) all exceptionally polite and chatty. Seemed genuinely happy to be working there (Very much a rarity to see!). *Only note would be that we would have liked a fridge in the room. I have been in a lot of hotels all over the world, but this hotel stood out to us very much so (33 & 39 year olds) with high standards! This hotel should be a 4 star, not a 3 star. Was exceptionally impressed with the staff, they very much stood out and should be commended on their attitudes and work ethic. Why come all the way to Araan and frequent a chain hotel. The food and service were fine, but it had a tired feel and seemed to have a lack of investment. There are more authentic and modern places nearby, use them. We loved our stay here. The hotel is in an excellent location (if you want peace and quiet), and the facilities more than adequate. The views from both the dining room and breakfast room are wonderful, looking out over the sea. One of our two rooms shared the same panorama. My room overlooked the back of the hotel, but was still bright, airy and of good size for a single. Breakfast was a real pleasure - buffet style with everything you could think of, and we ate at the hotel most nights as the menu was varied and the food delicious, while being reasonably priced. I can't stress enough how pleasant and helpful the staff were - a real credit to Scotland. We would not hesitate to stay here again! "Ideal for a short getaway "
My partner and myself booked this for a short 2 night getaway. First of all the island of Arran was stunning. We got very lucky with the weather and we both got sunburnt which we were not expecting on a scottish isle! The hotel was lovely and special mention to the staff who were all very friendly polite and helpful. The hotel had great facilities with a nice sized pool, sauna, free wifi, public bar with sky TV and Internet jukebox and great selection of ales ciders and of course whisky. The rooms were very clean and of a decent size for 2 adults. The decor was a little bit dated in our room however as it was only 2 nights and they were clean then this was just a minor quibble. The public bar and the restaurant were both clean and service in both was good. The food in the hotel - both the evening meal and breakfast buffet - was of a good standard and enough choice to suit most palates. I did have to send my steak back on the first night as it was over cooked but it was changed with no fuss. The views from our room were over the mull of Kintyre and were spectacular. In the evening with the sun setting on the ocean it made for a romantic setting. All in all I would recommend this hotel and I think we shall be return visitors in the near future. The isle of Arran has plenty to do if you are there for 2-3 days and even if you have kids they wouldn't get bored as if the weathers not kind then the hotel has plenty to keep them occupied with the pool etc. I'd give the hotel 4.5 out of 5 overall. The four of us were staying on Arran for a week and we ate here twice . Had an excellent lunch of soup and a sandwich . The soup was superb and the sandwich was jammed packed full of filling plus coleslaw, crisps and side salad . Such good value . We decided to eat here on our last day and there was 20% off food ordered between 5-6pm . So after a lovely walk along golf course and beach we asked if they had a table free which despite the fact we hadn't booked and they were quite busy they accommodated us and we all had yet another fantastic meal . Well done Best Western . All the staff were polite and cheerful and helpful . The hotel was clean and in good repair and it is in a fabulous spot overlooking the Kintyre peninsula . Went for dinner, bookings are requested so we were a little early and waited in the bar, exceptionally busy. The staff were friendly and we had a magic view of the ocean from our table. We thought the dietary requirements had been for filled with ease. When the meals came out it appeared they had not. In addition, I found my meal to be bland and over cooked. I did have dessert which was very good. "Great place, great view, great staff"
I stayed with my extended family and we had an excellent time. The weather was good, which helped, but the hotel is in an excellent location and our room had a beautiful sea view. The staff are all lovely and helpful. My family and I love Arran and the Kinloch - what more can I say! We come every year (from Glasgow) - an hour's drive, an hour on the ferry, then into another more peaceful world. We always come to the Kinloch - we feel at home. Now, with young children, we take one of their apartments with a sea view but eat in the hotel. The hotel has a small swimming pool too. We come by car but there is a local bus service. Can't wait to go back! We have just returned from our first ever visit to Arran and were absolutely delighted with accommodation in this hotel. View from the front of the hotel is superb. We were delighted that a seal came to relax on a rock very close to the shore on the south side and within easy view from our room window. Our room was very nice. Window looked out over flat roof of swimming pool but don't be alarmed if you hear voices - pool is closed from 8pm. There is a house between the hotel and the beach but the view all around is wide enough to compensate. Lovely quaint little village with a lot of newer houses to the northern side. Hotel has an ample car park beside it and there is a very quaint little harbour beside that on the 'river' (more of a wide stream) estuary. Local butcher opposite alongside very good newsagent/gift shop. Road behind hotel has post office, cafe, local restaurant and guest house, garage, etc. Delighted to find bakery behind hotel run by hotel making breads, croissants, etc for public and hotel. Quite a few reviews have remarked that hotel food was not great. We found the breakfasts excellent - range of fresh foods, fresh breads, so much choice. Evening meals not so thrilling BUT everything is home cooked and plentiful. Vegetables in particular were very fresh and well presented. We did have problems with our room card keys but persevere and keep trying inserting and removing the card slowly and it eventually seemed to work! These locks seem to cause problems worldwide! Also, our bathroom fan seemed to give up the ghost on our final morning, so I hope this was mended in time for the next visitors. 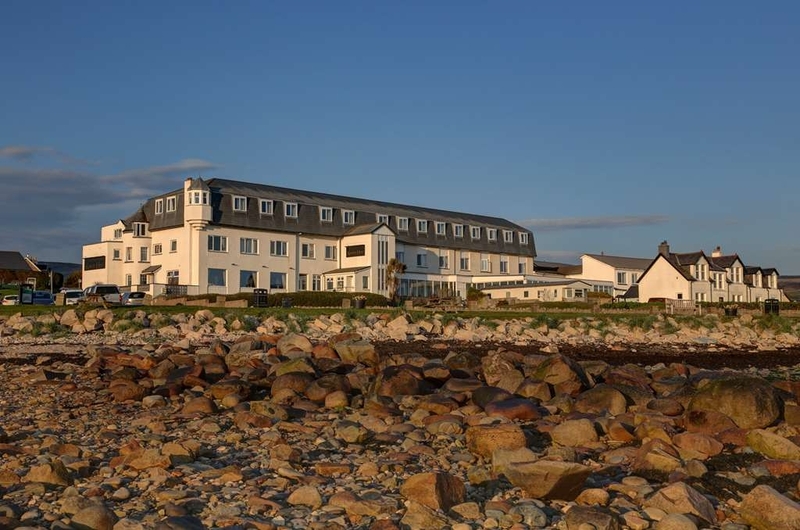 We wholeheartedly recommend this hotel, and indeed Arran, for a really refreshing holiday! "Had a lovely few days"
Had a lovely few days at the Kinloch Hotel. Pros: Really nice friendly staff Beautiful setting Excellent breakfast Cons: Rooms ok, sea view nice, essentially basic but did the job. Dining at night- food is nice, setting is dated! Get rid of the flower arrangements, dated pictures and mirrors, paint the wood with a nice beach wash paint to bring the establishment into this century. Get rid of the nasty curtains. The view makes the restaurant, the curtains do nothing for the view. We did like the hotel, few changes it would be lovely. Really enjoyed our visit and would return. We stayed here for a special occasion and cannot rate it high enough! Rooms were great with sea views, spacious and clean. Fantastic facilities with swimming pool, sauna and squash court. Fabulous position, right on the beach. A quiet and peaceful place. The food was lovely, would highly recommend and cant wait until we can go back. We've been a number of times now and no-one objected to booking again for next year as we departed. The location is wonderful and the top floor apartments allow a bit of freedom while being able to use the hotel facilities. The staff all lovely as always and big family dinner for 12 of us easily dealt with. We had a fantastic meal tonight in the bar (we got the grill room to keep kids in check). The food was delicious and kids meals perfect for them. Staff are always very friendly. Would highly recommend. Stayed at this hotel for 1 night with my boyfriend, had a great stay the room was lovely, really spacious and the view was out of this world. The weather wasnt very nice in Arran when we were there so we were stuck for things to do, however we went out a nice walk and had a meal in the restaurant. My boyfriends chicken wasnt very nice that he had for starter, this is the only reason this is not a 5 star review, however the rest of the food was fantastic. The staff are soo friendly and very welcoming. Honestly would recommend this if planning a trip to Arran. We were planning on using the spa but we never got round to it, but seen people in the pool everyday. 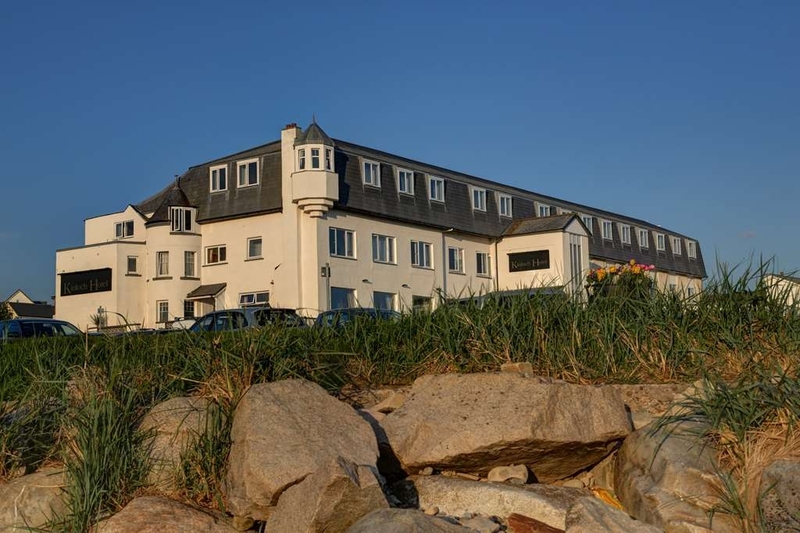 "Fabulous hotel, fabulous food, fabulous staff"
My son and I stayed at the hotel for three nights as part of a tour of Arran organised by David Urquhart Travel. We were warmly welcomed immediately we arrived and directed to our room, whilst our luggage was brought up. 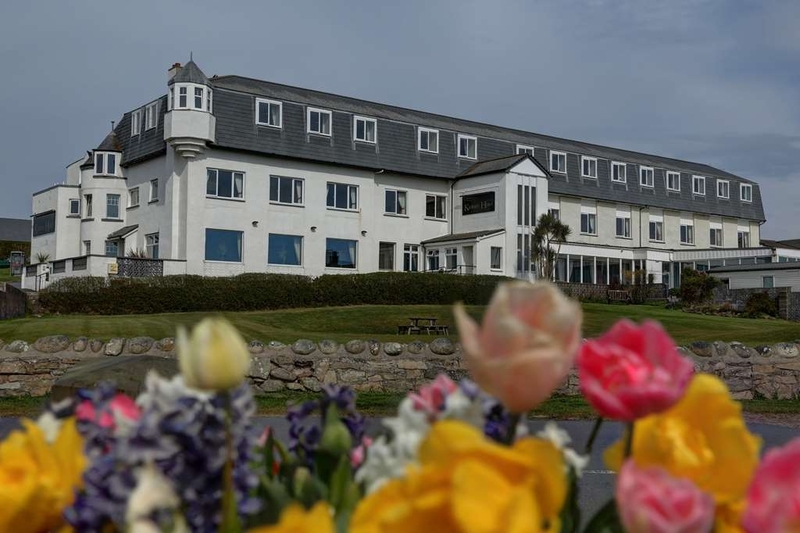 The hotel which is in great condition is in a lovely quiet location set within nice gardens with fabulous sea views which can also be seen from a lot of the bedrooms. There is a large heated swimming pool and sauna, which unfortunately we did not have time to use, but which looked lovely. The bedrooms are a good size and are clean, with comfortable beds and a kettle and all you need for a morning cuppa. The en-suite bathroom was clean and pleasant with toiletries and fluffy towels. The bedrooms were serviced daily and to a good standard and all areas within the hotel were clean and comfortable. There is a lounge and bar area which were comfortable, clean and in good order. The staff team were always polite and pleasant, providing answers to any question regarding places of interest to visit on Arran and times of buses, providing timetables.The food served in the very pleasant dining room was plentiful, fresh and tasty with a good choice and the service prompt and efficient. I would definitely be happy to visit the hotel again in the future. The hotel is in a good location and has some stunning views over the water to Kintyre. As soon as you arrive in reception you are made to feel welcome. The service is very good for every thing,all meals,bar, and housekeeping. "Great Place to Stay (& Eat)"
Stayed at The Kinloch Hotel for three nights when on a short golfing holiday to the Isle of Arran. Staff are really attentive and helpful. We were welcomed from the moment we arrived to the morning we departed. Rooms are clean and comfortable. Ours had a sea (Mull of Kintyre) view which was an added bonus. Dinner selections were plentiful with good quality Scottish food in pleasant surroundings. Breakfast too was very good and buffet style, although I did prefer the smoked haddock and poached eggs which are cooked to order. The bar area was friendly with two real ales, lagers, cider and spirits available. 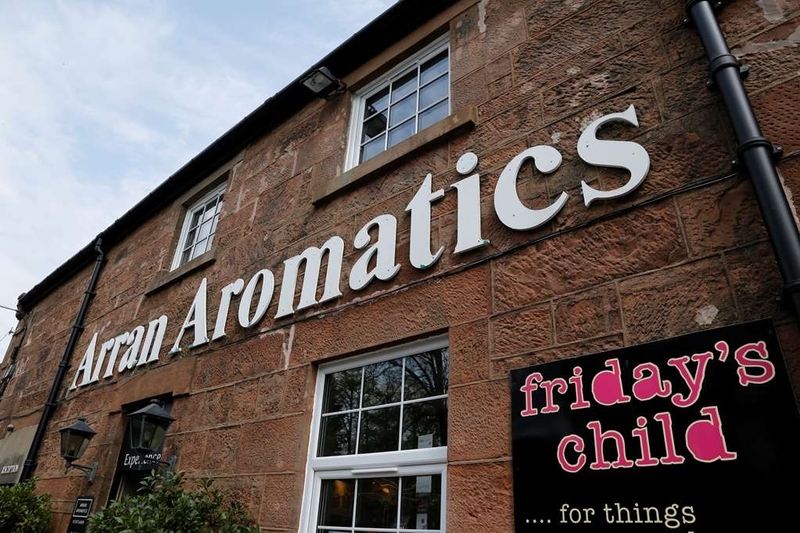 Highly recommend this establishment if you're visiting Arran. We'll definitely be back. Many thanks to Deborah for organising our booking and looking after us so well ???? "Lovely local hotel v friendly staff"
"Great lunch stop for cyclists on Arran"
5 of us were cycling around Arran today and the weather became rather wet. We turned up at Kinloch Hotel for a lunch stop and to warm up. The staff could not be more helpful, handed out large towels and offered to put our tops into the staff tumble dryer to dry us out. Had a great soup and were refreshed ready for final leg to ferry. Thanks again team ???? amazing hotel well situated on the west coast overlooking Kintyre great food staff always willing to help with a smile rooms comfy and double rooms with great views highly recommend. also attractions within walking distance. "Great hotel in lovely location." Stayed here for four nights whilst visiting the beautiful Isle of Arran. The staff were absolutely lovely and very efficient. Always a smile and greeting at meal times. We had breakfast and evening meals and always found the meals very good. We stayed in the Drumadoon rooms and had a great view of the harbour from the bedrooms. Such a peaceful and tranquil place. We were blessed with good weather also and so were able to visit all the local villages and sights. We would have liked a fridge in the room to keep drinks cool as it was so hot. Just a walk along the harbour and we saw seals and sea otters and oyster catchers. Good if you like bird watching. Just come back from a wonderful trip to Arran. We were on a walking holiday with our local group. Although I have been going to the island all my life, this is the first time I have actually stayed any longer than a couple of hours at the hotel. On arrival we were given our keys right away and to my surprise no paperwork to sign. We had a large room with great views of the water and especially the wildlife right outside our windows. This included the local seal population. The room was large and bright with the essential tea and coffee condiments. Knowing the island as I do, I wasn't surprised by some of the problems the hotel had. My own family used to own a hotel near Brodick. So I didn't complain. The most annoying thing that everyone complained about was the door entry system. It was the usual card system. You either got in first time or more likely try both cards many times until they worked. The other problem was the lack of hot water in the bathroom. I know there was a problem and hopefully by now it's been sorted. The facilities there are very good and free to residents. It was a pity that we didn't know there was a washing machine etc in the self catering area that could used. This was only pointed out to us by a member of our group who was going on another walking holiday in the Yorkshire Dales after Arran as we travelled back on the ferry to Ardrossan. They told us that the receptionist was even in the dark about it. The hotel is the only realistic place to eat and drink on the west side of the island. So during the day, it's very busy with day trippers and people in caravans. The hotel staff were very pleasant and always there to help you. The food we got was good and plentiful. I just wish we had got some of the food on offer from then resultant menu. The food there look great and again. Doggy bag time. The hotel has a drying room but such was the weather, it was more sandals and shorts weather. Not your usual Arran weather. Please note that although it has a bus terminus outside the hotel. They are few and far between. Car is best. Plenty of spaces. Chose the hotel by chance but will return again. Absolutely delightful and friendly staff, spotless bedrooms with ensuite bathrooms containing the largest fluffy white towels I've ever used. You could possibly misplace a small child in one if you aren't careful!!!!' Spectacular sea view across to the Mull of Kintyre. Food a little on the expensive side but quality of the highest order. Wide selection of choice. If you like fish do try the kippers at breakfast. Plump, moist and melt in the mouth. If you are a golfer the beautiful Shiskine Golf Club is a matter of a 10 minute walk away. First visit to Arran but can't wait to return. Sunset at Blackwaterfoot taken from our bedroom window. Lovely hotel in beautiful setting on Arran. Friendly staff who were always willing to help. Clean throughout and a safe bet for your holiday accommodation. Would visit again next time we are in Scotland. "Great hotel for a short break or longer"
"Lovely friendly hotel , great views"
Our apartment on the second floor, which overlooked the sea with glorious views across to the Mull of Kintyre, was beautifully clean and was well equipped. There was a good choice of food in the bar and what we had was delicious.The staff all go out of their way to make you feel welcome. This is most definitely the best hotel we have ever stayed in and would recommend it to anyone visiting Arran. "Everything we wanted for a week away!" We stayed in the Kinlock hotel for five nights and I must say it is the best hotel we have stayed in in for a long time, the food the staff and surroundings are amazing, Also cal -mac ferries could not do enough to help us with our crossing will certainly be back. "Great hotel, friendly staff, great food"
Loved my stay at the KInloch Hotel. Beautiful location. Hotel is comfortable and very relaxing. The staff and extremely friendly and helpful. Rooms are adequate and beds are comfortable. Food was excellent (soup and ribeye steak) and plentiful. Plenty of options for breakfast. Looking forward to returning in the near future. "Great hotel, friendly staff, great food." Loved my stay at Kinloch Hotel. Beautiful location. Hotel is comfortable and very relaxing. The staff are extremely friendly and helpful. Rooms are adequate and beds are comfortable. Food was excellent, (soup and ribeye steak) and plentiful. Plenty of beakfast options. Will return in the near future. We were part of a coach trip last week when the weather was terrific,so we were very lucky.A definite bonus.The staff were so welcoming & friendly(& mostly local I think)Our room was very nice,sea facing(lovely views)& well furnished with flat screen tv,toiletries & good towels. Though we were on a fixed menu,I must say,it was pretty good,choice of 3 items in each course.And I noticed there was a great variety for the other guests,lots of fish. The staff were all very pleasant & helpful..Didn't try the leisure facilities,too busy going out & about & enjoying the area. Would definitely recommend this hotel. We were touring Arran and popped in here to see if we could have coffee with our dogs. This was absolutely no problem, we were directed to the bar and served really good coffee by a friendly waiter. Dogs offered water bowls. We had a nice view of the sea and the seals basking on the rocks. The attached restaurant and bar were great for a meal and whisky. A bonus was a laundry room, with complimentary detergent for guests (the dryer took a few hours, so we just brought our clothes back to the room & laid them out to dry, a minor inconvenience, but no big deal). And, there was an indoor pool, not sure if it was heated, but if I had brought my swimsuit, I'd have definitely gone in. Lots of breakfast items, full buffet as well as anything you asked for cooked-to-order. Nice stay, I'd go back if were in Arran. We were here for the Arran Coastal Trail Run. The hotel was very welcoming, all staff were friendly and helpful. The room was excellent value, and the view of the sea from the window was a bonus. We ate in the restuarant each night, and the menu was sufficiently varied so that we could eat there each night without repetition. Leisure club was basic, but we weren't there for that ! This is an excellent hotel, which I'd return to again....and again. "Great hotel room and view"
"Deluxe self catering apartments are idea for family"
The Delux self catering apartments have two double bedrooms, one ensuite and andditional second bathroom. Each bedroom well equipped with large screen tv, and lounge / kitchen dinner has everything you need including dishwasher. Very clean. Very well kept. Hotel has pool and sauna, but when we visited the gym had been closed, although the hotel site still listed it. Restaurant food good, including the inclusive breakfast. Hotel staff very friendly and accommodating. A group of friends and I used this as a cycling hub for our stay on Arran, before cycling down to Campbeltown. I would use again. We enjoyed the best bar meal we have had for a long time. Beautiful fish sharing platter followed by fantastic pan fried duck breasts, cooked to perfection. Very reasonable price for top quality food. Highly recommended. .......is what it must have been when we were there. We only had a meal as we were staying elsewhere but we were very disappointed in the quality of the meal. The waiting staff were exceptionally good and could not be criticized at all and this is the reason our review was given three stars instead of the two it deserved on the noght we were there. . The starters were only ok and the cullen skink had hardly any fish and was mainly potato. The quality of the main courses were very poor, the featherblade beef looked grey and was flavourless. The desserts looked as though they had been bought in and were small and disappointing. We have eaten here before and it was much better then so we will give this place a miss next time we visit Arran. "Lovely dining area (on a clear day)"
We had a lovely meal here and to make it better it was a great day with sunny weather so had clear views over to Campbeltown from the great big windows which overlook the Clyde. Nice selection of food, great tasting and a good service. Had a lovely lunch here while on a coach trip.Every thing had been prepared in advance for our arrival and we had lovely soup ,tea coffee and a selection of tasty sandwiches.The staff were very efficient and helpful.The hotel was huge and had a great view of the sea. Just returned from a brilliant weekend at this hotel, from the moment Eleanor checked us in with such a warm welcome & with ease,nothing was to much bother for her. We had the Ben Nuis apartment which was very comfortable & was serviced daily.We ate in the hotel both nights, On the first night our meal was lovely apart from one of the steaks being really small & very fatty but when asked if everything was okay & we said they immediately rectified this by bringing a replacement, staff were really apologetic. Breakfasts both mornings had a really great choice & all good & hot.staff suggested we go to Kings caves for a good walk (3 miles) which was enjoyable. We also enjoyed the swimming pool when we were there as well. Staff were all really helpful & friendly so thank you everyone for a most enjoyable stay, we will be back. We had an amazing stay herr over easter, staying in one of the newly refubished rooms near the lesuire club. The room was amazing and made our stay even more relaxing. Fabulous room, amazing food and lovely staff...what more can you ask for? We had the seafood platter which was perfect, especially in the setting of Kinloch. The spinach cannelloni was also spectacular, so fresh and tasty. We stayed at the Kinloch Hotel for 2 nights In March and had a great, comfortable stay. Staff were very welcoming, friendly & helpful. Room was spacious, well equipped & with a great sea view. This was our first stay at the Hotel ad would not hesitate to recommend to others. Thanks for great break. I've eaten here many times over the years, and it has always been very good. Unfortunately, the two times I visited recently the food was poor. The beer and service were good, but the vegetarian shepherds pie (one of the very few gf choices given to me) was bland. Large chunks of carrot, mange tout and green beans in tomatoes with sweet potato on top with a serving of carrot, mange tout and green beans on the side. Very poor. On the second visit I had steak- this was not seasoned and not worth what I paid. It was disappointing as it is usually one of my favourite places to eat. This is a comfortable hotel in a stunning location. The decor is a little tired looking however nonetheless this is a good place to stay. Arran is great for walking and I stayed here overnight on my way round the Arran Coastal Path. Just back from another fantastic trip to Scotland and our usual pilgrimage to the stunning Island of Arran! We once again set up camp in the self catering apartments at BEST WESTERN Kinloch Hotel, our own wee home from home. Love that fact that we opt to self-cater but the price includes a visit from house-keeping to make our beds every day and empty of bins! It's the little things :-) Arran itself was a mixture of sunshine and rain (fairy rain as the locals call it, improves the taste of the whisky!) but always stunning. Regrettably due to high demand on the ferries and us managing to make it all the way from New Zealand but not actually thinking ahead enough to book our return crossing we had to unfortunately leave a day earlier than planned to guarantee a sailing time. We advised reception of our plans and asked if it might be possible to keep the room until a bit after the usual 10am check out time and the girls very kindly gave us use until 2pm which allowed us to head straight to our connection. Congratulations Kinloch, you did it again! If you like wonderful views and good walks or even a base to tour the Island by car then you will like this Hotel. You are only 15 minutes away from the Ferry.All the staff are very helpful and friendly. The rooms are clean and the beds are comfortable. If you stay at the Hotel for your evening meal you will find a varied choice and the food is excellent. All in all it is a good relaxing break, and a place to re-visit. Great place to stay and tour Arran. Great wildlife and Castle etc. Can use bus service all over Arran to visit all Attractions. Saw Golden Eagles above the Distillery !!! Stayed at Kinloch Hotel which was terrific all round hotel experience staff were great and told us where to visit etc. Just back from spending a relaxing and enjoyable weekend here celebrating a birthday. Although it is rated 3 star, the atmosphere in the hotel, the pleasant, helpful staff and excellent food made this a memorable trip. The room we occupied had a fantastic sea view and lthough the decor was a bit 'tired' the room was clean and had everything we required. Only pity was that Arran Aromatic products were not available in the en suite. The breakfast offered a good range of options but it was the dinners on both nights that stood out, with excellent choices to suit all tastes. We were part of a birthday party and the staff worked hard to ensure every guest had an excellent time. Can't fault their attention to detail. 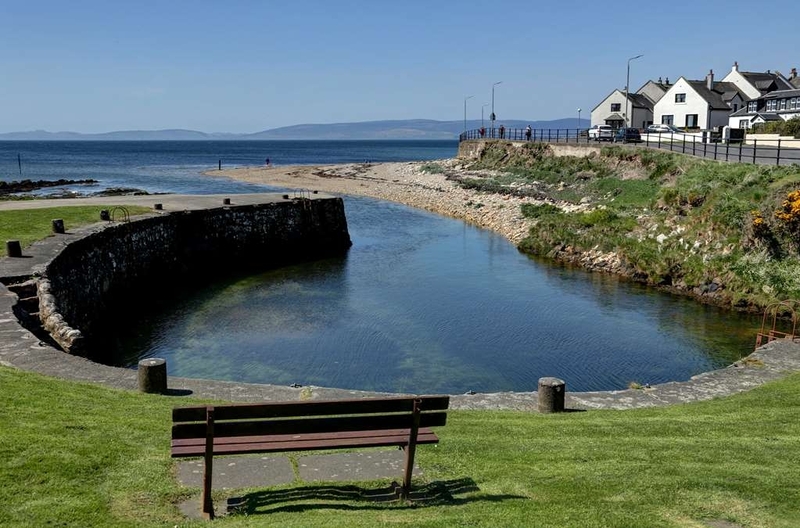 Blackwaterfoot is a lovely, quiet place, ideal for a restful and relaxing break and I would definitely recommend the area and the hotel. We have just returned from a three night break at the hotel. Fabulous. Half wish we could have had a storm to keep us on the island for a day or two more - not really but the hotel would have made it worth it. We had a great package, super rooms were spotlessly clean with sea views, watching the otters and seals, great food at good prices with excellent quality and some good wines/beers. Icing on the cake was the staff, to a man (and woman) they were all superb. Great attitude, nothing too much trouble, extremely pleasant and prepared to chat about the island and themselves. A real credit to the hotel. True service with a smile. Didn't try the swimming pool and the snooker room and squash court seemed to be de-commissined but that might just have been a short term thing (I didn't ask). There is a discount on food ordered before 6.00pm but I was advised it was only on the 'normal' menu items not the extended specials list. We last visted the island 34 years ago and vowed we would be back, well we finally made it. What took us so long - no idea as we vowed back then we would be back time and again (we even met up with the farmer and son who provided us hospitality back then, disappointed that the good lady was out for the day). Perhaps this is the start. Super island for long, short walks, lovely beaches and much cheaper ferries than the recent past. Book the Kinloch, you won't be disappointed. We stayed here for a short break in March. The place is ideally suited for some of the walks, standing stones and other attractions. The hotel rooms are apparently being renovated but our room was absolutely fine, with stunning views over the sea. We planned to eat there one night and find somewhere else, but ended up eating there both nights. I have never seen bigger portions of fish and chips anywhere. The fish was huge. The staff were very friendly and knowledgeable and made the stay very enjoyable. We stayed at the Kinloch Hotel in Arran for my partner's birthday. This was supposed to be for only two nights, but storms had caused the cancellation of the ferry back to Ardrossan, meaning we stayed for a third night. The hotel were nice enough to call us after hearing the ferries had been cancelled to offer or same room (at extra cost), very good service. The room was nice, clean and spacious. My only complaint is that the window whistles like a high pitched old school kettle on the boil during a storm. Since the hotel is on an island, I doubt I experienced the very first storm to happen there, so surely someone has mentioned the noise from the window previously. It was incredibly loud and difficult to sleep through the night, might be worth slapping a bit of sealant on there. Staff were pleasant and the breakfast was good. I would stay here again, I'd just be sure to bring earplugs next time. "An Excellent Hotel for a Break"
We enjoyed a two night short break which was very good value and would love to come back maybe when the weather is better. Our room was large with a comfortable four poster bed. Everything worked as it should. The tv was rather small for the size of the room and distance from the bed. The service was excellent and the breakfast was excellent. Although we have now moved to the island to live, we came to the Kinloch hotel for our wedding anniversary. We got married here 13 years ago and have stayed many, many times. We are pleased to say that the hotel and staff are as wonderful as they were 13 years ago. Robbie and his staff are welcoming and always go the extra mile for all their guests. Whether you are staying or just popping in for a light refreshment. Keep up the good work guys !!! See you soon ?? Stayed for 3 nights, hotel is clean, good location, food was good. Pool and sauna looking a little dated but certainly not enough to put you off. Staff were very nice. All in all a decent place to stay. Just returned from two nights at the kinloch on an it is on deal. The rooms were basic but very clean and well stocked with all you could need. We used the pool and sauna twice which is a good addition to the hotel. We dined both nights in the hotel and the food was lovely. Breakfast to die for with lots of extras you could order. Staff very friendly and always asked you what you had been up to without being in your face. All in all a lovely visit and would definitely return again! "Excellent location, service and value"
The Kinloch hotel advertises itself on three pillars of location, service and value and for our family it ticked excellent for all of those boxes. Just returned from a short break there and the friendliness of all the staff is as true as all the reviews say. The location by the sea and the proximity to some great walks is fantastic. The self catering apartments are spacious and well equipped and unbelievably good value. We all had a superb time and definitely preferred this side of the island. If there was any shortcoming - the indoor pool could do with an update - but with the glorious weather we had - that didn't bother us as we wanted to spend most of our time outdoors. Highly recommended! "Beautiful location and a lovely relaxing place to stay"
We stayed here for a couple of nights whilst visiting family on the island and were overwhelmed with its locality, the views from our room were stunning. The rooms are comfortable, warm and well stocked with tea, coffee and all bathing requirements. We ate in the hotel each night and took advantage of the 20% off by dining between 5-6pm, the food was delicious and plentiful. Breakfast again was delicious, plenty of variety and helpful staff to bring tea and coffee. All of The staff were all extremely friendly and helpful at all times. We will definitely return some time in the future. The hotel facilities were excellent. Nice bar with a good selection of wines, beers and spirits. The single room was spacious with good wi fi and a lovely bathroom. The staff, overall, were very helpful and knowledgeable about the island. A special thanks to Deborah at reception and Debbie the chambermaid for all their assistance. The only downside was the weather which caused all the ferries to be cancelled on the Sunday causing major upheaval on the island. However you can't blame the Kinloch for that. On a wee jaunt around the Isle of Arran we stopped at the Kinloch Hotel in Blackwaterfoot for a quick snack. Arriving at 3pm we were a bit late for lunch which finished at 2:30pm but they still had a soup and sandwich menu along with a selection of scones and cakes. Local Arran ham sandwich served with a crisp mixed salad, coleslaw and crisps along with a bowl of lentil soup hit the mark and good value at £7.45. Staff friendly and efficient so I'll definitely give the Kinloch a try again. Myself and my husband attended an event at The Kinloch last night. Every detail was planned to perfection. The function suite was beautifully decorated and all the public areas were spotless and fresh. The staff were really friendly, exceeding polite & engaging throughout. A great team! The food was utterly outstanding. I had duck to start, beef for my main and cheese for my desert. Both meats were cooked to perfection and served with mouthwatering sauces. Not what you expect at all when catering for a very large group. I'm celiac which was no bother at all. In fact most of the menu with gluten free. Which really was a welcome treat for me. My cheese was gorgeous too. A nice mix of quality cheese. My only disappointment is that myself and my husband can't get married again, because we'd pick the Kinloch! Perfect night guys. Thanks. "First Class Hotel, Great Event"
Just arrived back home after a great fund raising event and St Andrew Dinner dance in this wonderful hotel. The staff were extremely professional, friendly and very well motivated. The evening went like clockwork, the food was amazing and perfectly organized and coordinated. Over 100 guests fed in less than an hour. The double room was well furnished and cozy. Breakfast a very enjoyable full Scottish type meal with plenty of cereal, fresh fruit and pastries. Well done Kinloch, back again next year, for the dinner but much sooner with my family. Thank you very much to the management and staff at the Kinloch hotel! We stayed this weekend and enjoyed very comfortable surroundings, delicious food and extremely hospitable staff. The bedrooms were well decorated and extremely clean. We had lunch, dinner and breakfast in the hotel and all were to a very high standard the breakfast was top notch as always! Thanks again! The staff were absolutely fantastic and couldn't do enough for me. They were flexible friendly and very helpful. The breakfast is to die for, the best range and selection I have seen in a long time. The restaurant and main bar are a delight with the most reasonable prices. The food choices were quite large and is of the highest quality, it tastes fabulous. I was staying there on the 5th of November, there was a firework display and bonfire right out side on the beach, wonderful. The whole experience left me feeling like Christmas had already arrived. "Great sea views. Not much choice around for food except in the hotel"
Blackwaterfoot is the other side of Arran from Brodick. The location is great with excellent sea views and good walking close by + golf if you do! The hotel was welcoming with reasonable rooms if a bit old fashioned. The restaurant was good with very efficient staff and a homely bar area. Make sure you book 'cos there is only one other eatery nearby. You need a car to get here but the time from Brodick where the ferry lands is only 20 minute. Lots of Arran is quite remote and this is a good stopping place to explore away from the more developed Brodick area. This is a gem of a hotel. The building is traditional, in a great setting on the seafront looking across to the Mull of Kintyre. What makes this hotel so special is its staff. It would be unfair to single out any one of them, in part because some are "behind scenes". Each gives very fully in making sure the hotel guest may arrive as a stranger but leaves as a friend. The quality of service is one which many a 5* rated hotel would do well to emulate. Nothing is too much trouble. This is not a chrome and glass faceless establishment, rather a down to earth great value hotel. While I do not know figures I am sure the number of guests who return on a regular basis will be amongst the top rated. A wonderful holiday. 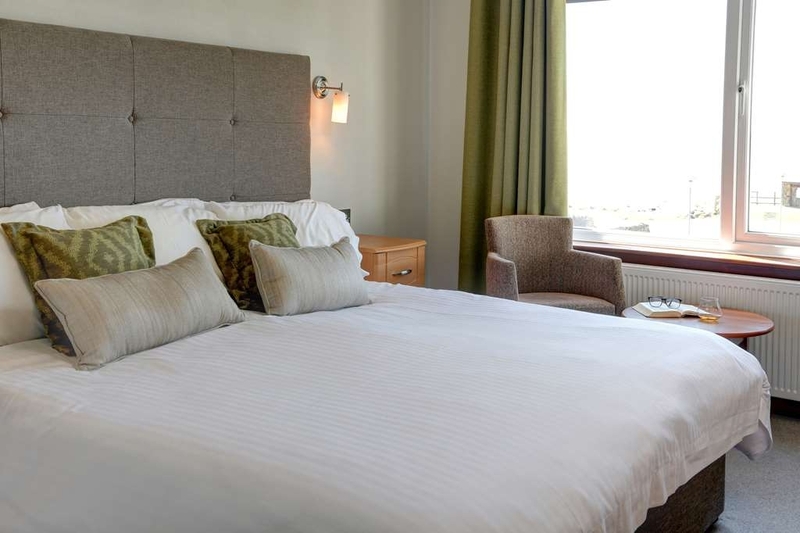 "Excellent facilities coupled with efficient, helpful and friendly staff"
Rooms are furnished to a high standard. Food is excellent. The hotel had no difficulties coping with a large group (75) of walkers. Swimming pool. Beautiful seaside setting. Good value. The staff could not have been more welcoming. lovely friendly hotel. food excellent and staff and service cant be faulted. great base for holiday in Arran. we stayed in two bed apartment however had breakfast and some meals in hotel and was never disappointed with food or service. Lovely location and plenty to do on island well worth a visit. Probably 6 years since my last visit. The views from the hotel must be the best feature, stunning. The rooms are slightly dated as are the bathrooms but the shower was powerful. The staff are also excellent. I felt the food could have been better but good value. My wife and I went on a short coach break with "Moving People" and once again, they came up with another winner of a hotel. It might seem somewhat "old fashioned" to some people, but it has a charm that is endearing. We had a spacious room with a sea view and we sat at our little table in our comfy armchairs watching the seals playing. The bathroom/shower was adequate for our means. Everywhere was clean and well looked after. Staff were exceptional and we always helpful and whatever you asked them, they did with a smile and friendliness. The restaurant was bright and airy with views out to the sea. The food, apart from one evening meal, was very good. We had a three course meal with tea or coffee and I enjoyed the starters, especially as there was a fish choice each evening. The meals were well present and well cooked, apart from one meal. Arran Lamb was on the menu and I found it rather tough. I was not the only one, as I spoke to six other guests who said the same thing and the Lemon Tart, (which I did not have, but my wife and seven others did), was not very lemony and the pastry somewhat "doughy" in their opinions. Despite this, we enjoyed all our meals and breakfast buffet had a great choice and set you up for the day. We went on various trips, including Brodick Castle and Gardens, (superb) and the Arran Distillery (enjoyable but entry over-priced for what you get). I used the indoor swimming pool every day, which was a bonus for me. Lots of people, owing to the unusually warm, sunny weather we had, would sit outside and have a drink. As for location, well, overlooking the Mull of Kintyre, (we did watch the mist roll in) and the sunsets were just incredible. The hotel, situated on the headland, took view advantage of the views and it was next to a little river with a waterfall. Shops, bakers and post office all in a few minutes walk and a lot of guest went for early morning or early evening walks to watch the seals. The local Golf Club was a few minutes walk, and we met many other guests there having coffee or lunch. There are also several local walks and one along the coast to the King's Cave. It is a family friendly hotel and we heartily recommend it - with the views that you will want to photograph again and again. We loved Arran so much, that we intend visiting again. We had a wonderful stay here. The staff were without exception, friendly, helpful and polite. Our room was well decorated with a lovely bathroom and an absolutely lovely view across the sea. The only negative thing is that we were over the swimming pool and as we had the window open all the while, we could hear echoing shouts when it was busy and ventilation fan noise. (my ears are very sensitive!!) This would not put us off staying again. The wifi did not reach our room but was fine in the reception, bar and restaurant so that was fine. The view from the dining room in the evening, where you could watch the sun set was amazing. The food was delicious, we enjoyed every dinner. The hotel is in a lovely spot, quiet, great views, a beach. There is a little shop which sells postcards, gifts, household bits and bobs. We loved our stay on Arran and were glad we found this hotel. Stayed at the hotel 1 night as part of a golfing trip. The hotel is a 3 star and we really enjoyed the hotel, great food and service from every member of staff. Rooms were decent and very clean. Wouldn't hesitate to go back. "Great hotel in a quiet area on the Isle of Arran"
The hotel is in a beautiful quiet location on the Isle of Arran. The staff was very friendly and helpful. They always asked if I enjoyed my day and what adventure I did that day. The food was excellent. The room I had was okay for me. It could use some updating but it was clean and I did have everything I needed. If you like walks on the beach this would be the place for you to stay.